Isaiah 11:12 - And he shall set up an ensign for the nations, and shall assemble the outcasts of Israel, and gather together the dispersed of Judah from the four corners of the earth. Ezekiel 7:2 - Also, thou son of man, thus saith the Lord GOD unto the land of Israel; An end, the end is come upon the four corners of the land. Revelation 20:8 - And shall go out to deceive the nations which are in the four quarters of the earth, Gog and Magog, to gather them together to battle: the number of whom is as the sand of the sea. Debunked: Point #1: If flat-earthers claim the earth has four literal corners then the flat earth cannot be a circle which disqualifies their flat earth from fitting the Isaiah 40:22 description of the earth being a circle, “circle of the earth” because their flat earth is a square. Flat-earthers cannot escape this fact because the scriptures flat-earthers use (Isaiah 11:12, Revelation 7:1, and Revelation 20:8) all say: “The four corners of the earth.” The four corners are just as much the earth as the land we're standing on according to the Bible. Therefore, if flat earthers want to be true to the scriptures they use, then the flat earth is a square and not a circle. Point#2: Furthermore, flat-earthers claim God will call Israel from the four corners of their flat earth. “…gather together the dispersed of Judah from the four corners of the earth.” (Isaiah 11:12) How can God gather people from the four corners of the flat earth unless people are capable of living in that four corner region? On the flat earth model, this four corner region is actually in an uninhabited region of the earth. How could people live in this four corner region unless the flat earth dome covered all of the square portions of the flat earth? If the flat earth dome covered the square earth, then the dome would have to be square like the square earth. Yet, the day and evening sky does not have the appearance of a square box. This should be proof to flat-earthers that their scriptural interpretation is wrong. The nations mentioned in Isaiah 11:11-12 are not in some distant four corner region beyond Antarctica like flat-earthers believe. In fact, most are in the immediate regions around Israel. This debunks the flat-earth narrative about the four literal corners of the earth (their square earth). As we can see, God will gather his people from the four corners of the earth, which are the four points of the compass (North, South, East, and West). His people are coming from all 4 points/quadrants of the compass. Jeremiah 49:36 - And upon Elam will I bring the four winds from the four quarters of heaven, and will scatter them toward all those winds; and there shall be no nation whither the outcasts of Elam shall not come. Ezekiel 12:14 - And I will scatter toward every wind all that are about him to help him, and all his bands; and I will draw out the sword after them. Ezekiel 17:21 - And all his fugitives with all his bands shall fall by the sword, and they that remain shall be scattered toward all winds: and ye shall know that I the LORD have spoken it. Daniel 7:2 - Daniel spake and said, I saw in my vision by night, and, behold, the four winds of the heaven strove upon the great sea. Daniel 8:8 - Therefore the he goat waxed very great: and when he was strong, the great horn was broken; and for it came up four notable ones toward the four winds of heaven. Daniel 11:4 - And when he shall stand up, his kingdom shall be broken, and shall be divided toward the four winds of heaven; and not to his posterity, nor according to his dominion which he ruled: for his kingdom shall be plucked up, even for others beside those. Zechariah 2:6 - Ho, ho, come forth, and flee from the land of the north, saith the LORD: for I have spread you abroad as the four winds of the heaven, saith the LORD. DEBUNKED: ​The four winds are also the four quadrants of the earth, which are the directions of the compass and similar to the discussion presented above for the four corners of the earth. The four winds are winds that come from the North, South, East, and West or between quadrants. Deuteronomy 28:64 - And the LORD shall scatter thee among all people, from the one end of the earth even unto the other; and there thou shalt serve other gods, which neither thou nor thy fathers have known, even wood and stone. Deuteronomy 33:17 - His glory is like the firstling of his bullock, and his horns are like the horns of unicorns: with them he shall push the people together to the ends of the earth: and they are the ten thousands of Ephraim, and they are the thousands of Manasseh. 1 Samuel 2:10 - The adversaries of the LORD shall be broken to pieces; out of heaven shall he thunder upon them: the LORD shall judge the ends of the earth; and he shall give strength unto his king, and exalt the horn of his anointed. Job 37:3 - He directeth it under the whole heaven, and his lightning unto the ends of the earth. ​Job 38:13 - That it might take hold of the ends of the earth, that the wicked might be shaken out of it? Psalm 2:8 - Ask of me, and I shall give thee the heathen for thine inheritance, and the uttermost parts of the earth for thy possession. ​Psalm 22:27 - All the ends of the world shall remember and turn unto the LORD: and all the kindreds of the nations shall worship before thee. Psalm 46:9 - He maketh wars to cease unto the end of the earth; he breaketh the bow, and cutteth the spear in sunder; he burneth the chariot in the fire. Psalm 48:10 - According to thy name, O God, so is thy praise unto the ends of the earth: thy right hand is full of righteousness. ​Psalm 59:13 - Consume them in wrath, consume them, that they may not be: and let them know that God ruleth in Jacob unto the ends of the earth. Selah. Psalm 61:2 - From the end of the earth will I cry unto thee, when my heart is overwhelmed: lead me to the rock that is higher than I.
Psalm 67:7 - God shall bless us; and all the ends of the earth shall fear him. Psalm 72:8 - He shall have dominion also from sea to sea, and from the river unto the ends of the earth. ​Psalm 98:3 - He hath remembered his mercy and his truth toward the house of Israel: all the ends of the earth have seen the salvation of our God. Psalm 135:7 - He causeth the vapours to ascend from the ends of the earth; he maketh lightnings for the rain; he bringeth the wind out of his treasuries. Proverbs 17:24 - Wisdom is before him that hath understanding; but the eyes of a fool are in the ends of the earth. Isaiah 26:15 - Thou hast increased the nation, O LORD, thou hast increased the nation: thou art glorified: thou hadst removed it far unto all the ends of the earth. Isaiah 40:28 - Hast thou not known? hast thou not heard, that the everlasting God, the LORD, the Creator of the ends of the earth, fainteth not, neither is weary? there is no searching of his understanding. Isaiah 41:5 - The isles saw it, and feared; the ends of the earth were afraid, drew near, and came. ​Isaiah 42:10 - Sing unto the LORD a new song, and his praise from the end of the earth, ye that go down to the sea, and all that is therein; the isles, and the inhabitants thereof. Isaiah 45:22 - Look unto me, and be ye saved, all the ends of the earth: for I am God, and there is none else. Isaiah 48:20 - Go ye forth of Babylon, flee ye from the Chaldeans, with a voice of singing declare ye, tell this, utter it even to the end of the earth; say ye, The LORD hath redeemed his servant Jacob. Isaiah 49:6 - And he said, It is a light thing that thou shouldest be my servant to raise up the tribes of Jacob, and to restore the preserved of Israel: I will also give thee for a light to the Gentiles, that thou mayest be my salvation unto the end of the earth. ​Isaiah 52:10 - The LORD hath made bare his holy arm in the eyes of all the nations; and all the ends of the earth shall see the salvation of our God. Jeremiah 10:13 - When he uttereth his voice, there is a multitude of waters in the heavens, and he causeth the vapours to ascend from the ends of the earth; he maketh lightnings with rain, and bringeth forth the wind out of his treasures. Jeremiah 16:19 - O LORD, my strength, and my fortress, and my refuge in the day of affliction, the Gentiles shall come unto thee from the ends of the earth, and shall say, Surely our fathers have inherited lies, vanity, and things wherein there is no profit. Jeremiah 25:31 - A noise shall come even to the ends of the earth; for the LORD hath a controversy with the nations, he will plead with all flesh; he will give them that are wicked to the sword, saith the LORD. Jeremiah 25:33 - And the slain of the LORD shall be at that day from one end of the earth even unto the other end of the earth: they shall not be lamented, neither gathered, nor buried; they shall be dung upon the ground. Jeremiah 51:16 - When he uttereth his voice, there is a multitude of waters in the heavens; and he causeth the vapours to ascend from the ends of the earth: he maketh lightnings with rain, and bringeth forth the wind out of his treasures. Daniel 4:22 - It is thou, O king, that art grown and become strong: for thy greatness is grown, and reacheth unto heaven, and thy dominion to the end of the earth. Micah 5:4 - And he shall stand and feed in the strength of the LORD, in the majesty of the name of the LORD his God; and they shall abide: for now shall he be great unto the ends of the earth. Zechariah 9:10 - And I will cut off the chariot from Ephraim, and the horse from Jerusalem, and the battle bow shall be cut off: and he shall speak peace unto the heathen: and his dominion shall be from sea even to sea, and from the river even to the ends of the earth. Matthew 12:42 - The queen of the south shall rise up in the judgment with this generation, and shall condemn it: for she came from the uttermost parts of the earth to hear the wisdom of Solomon; and, behold, a greater than Solomon is here. Luke 11:31 - The queen of the south shall rise up in the judgment with the men of this generation, and condemn them: for she came from the utmost parts of the earth to hear the wisdom of Solomon; and, behold, a greater than Solomon is here. Acts 13:47 - For so hath the Lord commanded us, saying, I have set thee to be a light of the Gentiles, that thou shouldest be for salvation unto the ends of the earth. DEBUNKED: Flat-earthers believe when the Bible says the earth has edges or ends that it means planet earth has ends and edges. Therefore, in their mind, only the flat earth has edges and ends, so they believe the globe earth is not scriptural. What flat-earthers don’t understand is how the word “earth” is used in the Bible. The word “earth” can mean the entire planet or the land on the earth, or it can also mean the people on the earth. So, what’s the ends or edges of the earth? The ends and edges of the dry land. It’s the extreme parts of the land, distant locations, or the people living at distant locations. It could also be the place where the sea or waters meet the dry land (Earth). It’s not the ends or edges of the planet. Who is the Queen of the South? The Queen of Sheba, a decendant of Cush (likely Ethiopia, Egypt, Sudan, or parts of Arabia), but the Bible claims she came from the uttermost parts of the earth which is also the ends of the earth. The Ethiopian region or possibly Arabia is nowhere near the end of the planet. Therefore, this verse debunks the interpretation of the ends or edges of the earth in the Bible being the ends and edge of the planet like flat-earthers believe. (The "ends of the earth" and "the farthest sea" implying it's beyond the end of the earth (land) from the perspective of Israel. This proves the ends of the earth are the ends of the land and not the ends of the planet). Isles cannot fear and the ends of the earth cannot be afraid, so this verse is talking about the people on islands and the people of distant lands in fear. This can't be saying the end or edge of planet earth is fearful. Some translations say: “ends of the earth” and others refer to the coastlands and islands around the earth. Notice it’s the people that are told to sing praise to God from the ends of the earth / distant coastlands. Hard to do on the four corner (square) flat earth model that would have people singing in no man's land. Not so hard when you understand the verse is saying the people on distant land masses and islands around the earth should sing praise to God. The whole idea that the Bible is talking about the planet having literal ends and edges does not agree with the context of the Bible. Therefore, the flat-earther interpretation of the Bible is debunked. People need to use common-sense and let the biblical context interpret the meaning of the Bible. 1 Chronicles 16:30 - Fear before him, all the earth: the world also shall be stable, that it be not moved. Psalm 33:8-9 - Let all the earth fear the LORD: let all the inhabitants of the world stand in awe of him. For he spake, and it was done; he commanded, and it stood fast. Psalm 93:1 - The LORD reigneth, he is clothed with majesty; the LORD is clothed with strength, wherewith he hath girded himself: the world also is stablished, that it cannot be moved. Psalm 96:10 - Say among the heathen that the LORD reigneth: the world also shall be established that it shall not be moved: he shall judge the people righteously. Psalm 104:5 - Who laid the foundations of the earth, that it should not be removed for ever. Psalm 119:90 - Thy faithfulness is unto all generations: thou hast established the earth, and it abideth. Isaiah 14:7 - The whole earth is at rest, and is quiet: they break forth into singing. Isaiah 45:18 - For thus saith the LORD that created the heavens; God himself that formed the earth and made it; he hath established it, he created it not in vain, he formed it to be inhabited: I am the LORD; and there is none else. Zechariah 1:11 - And they answered the angel of the LORD that stood among the myrtle trees, and said, We have walked to and fro through the earth, and, behold, all the earth sitteth still, and is at rest. What flat-earther is going to dare say the sun and moon are established and cannot be moved? In their flat earth model, the sun and moon move in a rotation over the earth. Therefore, if they want to say Strong's H3559 means the earth cannot move then their sun and moon cannot move either. Let's take a look at the Hebrew word for “moved,” which is "timote" from the root word [mote] (Strong’s H4131). This word means the earth WILL NOT teeter, slip, fall, falter, be brought down, deviate, be overthrown, be out of course, be carried away, or be shaken out of course. Therefore, the earth can rotate and spin, but it will not deviate on its own from the way God designed it to operate which totally fits the definition of the Hebrew words for established (Tikkown from Kun) and for the word moved (Timote from Mote). These words do not mean planet earth is fixed and immovable as if it's locked down by chains. Here are the facts that totally debunk flat-earthers. If the same words and phrases are used for the righteous that are also used for the earth, then flat-earthers are obligated to apply their same interpretation to the righteous as they do to the earth. Therefore, according to flat-earther interpretation, the righteous are fixed and immovable. The righteous are unable to turn and unable to move like they claim the earth cannot turn or rotate. However, since reality shows us the righteous can move, turn, or rotate, then we must understand that the globe earth can move, turn, and rotate also. Therefore, flat-earthers are wrong and their interpretation of the Bible is seriously flawed. Psalm 75:3 - The earth and all the inhabitants thereof are dissolved: I bear up the pillars of it. Selah. The pillars are the movers and shakers of society or the leaders of the people. These pillars (leaders) of the earth are the Lord's, and he will set the world upon them. The weight (responsibility) of the world is upon them and they are called to support/serve the world. The leaders are also called shields in Psalm 47:9: "The princes of the people are gathered together, even the people of the God of Abraham: for the shields of the earth belong unto God: he is greatly exalted." Some translations say, leaders, rulers, or kings. So you have pillars of the earth and shields of the earth that represent leaders that God sets in place. ​Job 9:6 - Portions of Job chapter 9 are poetic and figurative. Verse 5 says: "Which removeth the mountains, and they know not: which overturneth them in his anger." Do the mountains have awareness? Is Job 9:5 implying that God caught the mountains by surprise and flipped them over without them knowing what happened? If you take the passage literal you'll come up with the conclusion that mountains have human-like awareness. However, if you see the message as figurative, then you'll understand the true message by properly interpreting the figurative wording. Following verse 5, is of course, verse 6, with a continuation of figurative wording about pillars trembling. Again, if you take the passage literal then you will conclude the earth has literal pillars that tremble in fear. However, if you interpret the verse as a figurative message, then the pillars could represent the leaders of the people trembling in fear because they see the anger of God manifested through earthquakes. Look at Isaiah 2:19 and Revelation 6:15-16 which have a similar message. Psalm 75:3 - Talks about the earth (the dry land) and the people on the earth melting or dissolving away. Obviously, figurative language is being used in this verse unless flat earthers want to believe that people were literally melting and dissolving away. Therefore, if this passage is speaking figuratively, then why would we assume the second half of the verse should be accepted as literal? The mention of pillars that God was "bearing up or balancing" should be taken figuratively. The verse is giving a figurative message that even if the world appears to be melting, dissolving, or falling apart, God is keeping everything together to prevent a total collapse of society. The Septuagint version of Psalm 75:3 gives an interesting insight into the verse. In the Septuagint, the message is that even if the earth and the people are melting away (liquifying), God is solidifying (stereoó Strong's G4732) the pillars (the support) of the earth. This figurative support (the pillars), could symbolize the real support of the leaders of the people holding up the world or the power of God to preserve and protect. Again, this is all figurative language, so it's not talking about literal pillars. If flat-earthers want to take this passage literal, then they need to explain how literal solid pillars are going to hold up a literal earth and literal people that melted away and turned to liquid. However, I know that most flat-earthers will not accept these answers because they are convinced in their head that the earth is supported by literal pillars. To most flat-earthers, the pillars of the earth function the same as the foundations of the earth. In that case, a full explanation of the pillars/foundation of the earth is explained in the next section below (see the debunk portion of the section below about the foundations). Deuteronomy 32:22 - For a fire is kindled in mine anger, and shall burn unto the lowest hell, and shall consume the earth with her increase, and set on fire the foundations of the mountains. 2 Samuel 22:8 - Then the earth shook and trembled; the foundations of heaven moved and shook, because he was wroth. Job 38:4 - Where wast thou when I laid the foundations of the earth? declare, if thou hast understanding. Psalm 18:7 - Then the earth shook and trembled; the foundations also of the hills moved and were shaken, because he was wroth. Psalm 18:15 - Then the channels of waters were seen, and the foundations of the world were discovered at thy rebuke, O LORD, at the blast of the breath of thy nostrils. Psalm 82:5 - They know not, neither will they understand; they walk on in darkness: all the foundations of the earth are out of course. Psalm 102:25 - ​Of old hast thou laid the foundation of the earth: and the heavens are the work of thy hands. Isaiah 48:13 - Mine hand also hath laid the foundation of the earth, and my right hand hath spanned the heavens: when I call unto them, they stand up together. Jeremiah 31:37 - Thus saith the LORD; If heaven above can be measured, and the foundations of the earth searched out beneath, I will also cast off all the seed of Israel for all that they have done, saith the LORD. Micah 6:2 - Hear ye, O mountains, the LORD'S controversy, and ye strong foundations of the earth: for the LORD hath a controversy with his people, and he will plead with Israel. Zechariah 12:1 - The burden of the word of the LORD for Israel, saith the LORD, which stretcheth forth the heavens, and layeth the foundation of the earth, and formeth the spirit of man within him. Matthew 13:35 -That it might be fulfilled which was spoken by the prophet, saying, I will open my mouth in parables; I will utter things which have been kept secret from the foundation of the world. John 17:24 - Father, I will that they also, whom thou hast given me, be with me where I am; that they may behold my glory, which thou hast given me: for thou lovedst me before the foundation of the world. Hebrews 4:3 - For we which have believed do enter into rest, as he said, As I have sworn in my wrath, if they shall enter into my rest: although the works were finished from the foundation of the world. Hebrews 9:26 -For then must he often have suffered since the foundation of the world: but now once in the end of the world hath he appeared to put away sin by the sacrifice of himself. Revelation 17:8 - The beast that thou sawest was, and is not; and shall ascend out of the bottomless pit, and go into perdition: and they that dwell on the earth shall wonder, whose names were not written in the book of life from the foundation of the world, when they behold the beast that was, and is not, and yet is. Foundations are the beginning of something. Flat-earthers claim planet earth is resting on a foundation with pillars. At the top of the page is an illustration of the flat earth model. The base of the flat earth is a solid, four-cornered block foundation. However, this model is not biblically accurate. The term "foundation of the earth" means several things. Most of the time, the foundations of the earth are referring to the creation of the earth like we speak about the founding of a city or the founding of a business. It’s the conception or start of something. Exodus 9:18: "Behold, to morrow about this time I will cause it to rain a very grievous hail, such as hath not been in Egypt since the foundation thereof even until now." This verse is not speaking of a literal foundation in Egypt, but the founding or start of Egypt. Psalm 24:1-2 - "A Psalm of David. The earth is the LORD'S, and the fulness thereof; the world, and they that dwell therein. 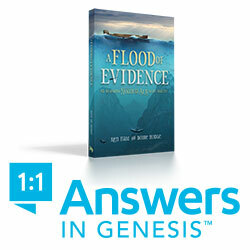 For he [God] hath founded it upon the seas, and established it upon the floods." Proverbs 3:19 - "The LORD by wisdom hath founded the earth; by understanding hath he established the heavens." All four of these verses use the Hebrew verb "yasad" (Strong's H3245) which is the root word for other Hebrew words related to a foundation (Mosad H4144, Mowcadah H4146, ). The noun form "yesud" (Strong's H3246) means "began or beginning." Yasad (Strong's H3245) can also be translated as counsel (Psalm 2:2 and 31:13), to make something (2 Chronicles 3:7), and to establish or ordain something (Psalm 8:2 and Habakkuk 1:12). Besides the meaning we just discussed, there is also a second meaning to the Old Testament phrase "foundations of the earth." If flat-earthers would let the Bible interpret the Bible they would learn about the concepts of the “foundations of the earth." This phrase also means the founding of the dry land from the waters. In fact, as we will see, the Bible will show what these foundations are. What did God name the dry land? EARTH! God called the dry land earth, but what about the foundations of the earth? What are or is the foundation(s) of the earth that the dry land rests on? Job 38:4-6 “Where wast thou when I laid the foundations of the earth? declare, if thou hast understanding. Who hath laid the measures thereof, if thou knowest? or who hath stretched the line upon it? Whereupon are the foundations (base) thereof fastened? or who laid the cornerstone thereof” The earth [dry land], is set on a base. The Bible Describes What The Base or Foundation of The Dry Land is. What are the foundations of the earth? The unseen land below us that can be seen under the sea. The land that rises up from the sea floor. The foundations of the earth according to the Bible is the rise of dry land from the seafloor that's still under the ocean: Genesis 1:9-10; 2 Samuel 22:16; Psalm 18:14-15, 24:2, 136:6; Proverbs 8:29; and 2 Peter 3:5. Look at the photo above that points from the seafloor to the top and to the surface of the dry land. The Bible Gives a Third Definition For The Foundations of The Earth. According to this verse, the foundations of the earth are also the mountains. We have mountains above the earth and we have mountains below the sea (Jonah 2:6) and in a sense, the rising of the dry land above the sea floor is a mountain (a foundation of the earth) as seen in the photo above. The foundation of the earth is not a thick, foursquare, block that flat-earthers invented like the illustration on the top of the page. The Bible perfectly describes the foundations of the earth which science can confirm. In the New Testament, we see various verses use the phrase: “foundation of the world.” (Matthew 13:35, 25:34; Luke 11:50; John 17:24; Ephesians 1:4; Hebrews 4:3, 9:26; 1 Peter 1:20; Revelation 13:8 and 17:8). "Foundation" – Themelios (Strong’s G2310) which is different from Themelioo (Strong's G2311). The phrase “foundation of the world” is not talking about literal foundations of the earth. If this phrase referred to literal foundations of the earth, then the New Testament would have used the Greek words: Ge – Earth (Strong’s G1093) along with the word Themelioo – Foundation (Strong’s G2311). We can see this in Hebrews 1:10 for God creating (founding) the dry land. When we read the "foundation of the world" in the New Testament the word for “world” is the Greek word “Kosmos” (Strong’s G2889). This word is not talking about the earth but the whole creation from earth to the solar system. In the New Testament, the "foundation of the world" does not support the flat earth doctrine because it's talking about something bigger than planet earth. The foundations of the earth are not what flat-earthers claim. Flat-earthers are way off base. Even the Bible debunks their flawed interpretations. The Bible clearly shows the foundation of the earth as the beginning or founding of the planet or dry land. The mountains on the land, mountains below the sea and the Continental Shelf/rise are considered the foundations of the earth (dry land). We don't live on a solid, four-cornered, square brick, with a disk sitting on top of it as flat-earthers claim. Genesis 1:29 - And God said, Behold, I have given you every herb bearing seed, which is upon the face of all the earth, and every tree, in the which is the fruit of a tree yielding seed; to you it shall be for meat. Genesis 4:14 - Behold, thou hast driven me out this day from the face of the earth; and from thy face shall I be hid; and I shall be a fugitive and a vagabond in the earth; and it shall come to pass, that every one that findeth me shall slay me. Genesis 6:7 - And the LORD said, I will destroy man whom I have created from the face of the earth; both man, and beast, and the creeping thing, and the fowls of the air; for it repenteth me that I have made them. Genesis 7:3 - Of fowls also of the air by sevens, the male and the female; to keep seed alive upon the face of all the earth. Genesis 7:18 - And the waters prevailed, and were increased greatly upon the earth; and the ark went upon the face of the waters. Genesis 8:9 - But the dove found no rest for the sole of her foot, and she returned unto him into the ark, for the waters were on the face of the whole earth: then he put forth his hand, and took her, and pulled her in unto him into the ark. Genesis 11:8 - So the LORD scattered them abroad from thence upon the face of all the earth: and they left off to build the city. Genesis 11:9 - Therefore is the name of it called Babel; because the LORD did there confound the language of all the earth: and from thence did the LORD scatter them abroad upon the face of all the earth. Genesis 41:56 - And the famine was over all the face of the earth: And Joseph opened all the storehouses, and sold unto the Egyptians; and the famine waxed sore in the land of Egypt. Exodus 33:16 - For wherein shall it be known here that I and thy people have found grace in thy sight? is it not in that thou goest with us? so shall we be separated, I and thy people, from all the people that are upon the face of the earth. Deuteronomy 6:15 - (For the LORD thy God is a jealous God among you) lest the anger of the LORD thy God be kindled against thee, and destroy thee from off the face of the earth. Deuteronomy 7:6 - For thou art an holy people unto the LORD thy God: the LORD thy God hath chosen thee to be a special people unto himself, above all people that are upon the face of the earth. Deuteronomy 14:2 - For thou art an holy people unto the LORD thy God, and the LORD hath chosen thee to be a peculiar people unto himself, above all the nations that are upon the earth. 1 Samuel 20:15 - ​But also thou shalt not cut off thy kindness from my house for ever: no, not when the LORD hath cut off the enemies of David every one from the face of the earth. 1 Kings 13:34 - And this thing became sin unto the house of Jeroboam, even to cut it off, and to destroy it from off the face of the earth. Job 5:10 YLT - Who is giving rain on the face of the land, And is sending waters on the out-places. Job 24:18 YLT - Light he is on the face of the waters, Vilified is their portion in the earth, He turneth not the way of vineyards. Job 26:10 TANAKH 1917- He hath described a boundary upon the face of the waters, Unto the confines of light and darkness. Job 37:12 - And it is turned round about by his counsels: that they may do whatsoever he commandeth them upon the face of the world in the earth. Job 38:30 - The waters are hid as with a stone, and the face of the deep is frozen. Psalm 104:30 - Thou sendest forth thy spirit, they are created: and thou renewest the face of the earth. Isaiah 18:2 YLT- That is sending by sea ambassadors, Even with implements of reed on the face of the waters, -- Go, ye light messengers, Unto a nation drawn out and peeled, Unto a people fearful from its beginning and onwards, A nation meeting out by line, and treading down, Whose land floods have spoiled. Isaiah 19:8 YLT- And lamented have the fishers, And mourned have all casting angle into a brook, And those spreading nets on the face of the waters have languished. ​Jeremiah 25:26 - And all the kings of the north, far and near, one with another, and all the kingdoms of the world, which are upon the face of the earth: and the king of Sheshach shall drink after them. Jeremiah 28:16 - Therefore thus saith the LORD; Behold, I will cast thee from off the face of the earth: this year thou shalt die, because thou hast taught rebellion against the LORD. Ezekiel 34:6 - My sheep wandered through all the mountains, and upon every high hill: yea, my flock was scattered upon all the face of the earth, and none did search or seek after them. Ezekiel 38:20 - So that the fishes of the sea, and the fowls of the heaven, and the beasts of the field, and all creeping things that creep upon the earth, and all the men that areupon the face of the earth, shall shake at my presence, and the mountains shall be thrown down, and the steep places shall fall, and every wall shall fall to the ground. Ezekiel 39:14 - And they shall sever out men of continual employment, passing through the land to bury with the passengers those that remain upon the face of the earth, to cleanse it: after the end of seven months shall they search. Hosea 10:7 YLT- Cut off is Samaria! Its king is as a chip on the face of the waters. Amos 9:8 - Behold, the eyes of the Lord GOD are upon the sinful kingdom, and I will destroy it from off the face of the earth; saving that I will not utterly destroy the house of Jacob, saith the LORD. Zephaniah 1:2 YLT - I utterly consume all from off the face of the ground, An affirmation of Jehovah. Zechariah 5:3 - ​Then said he unto me, This is the curse that goeth forth over the face of the whole earth: for every one that stealeth shall be cut off as on this side according to it; and every one that sweareth shall be cut off as on that side according to it. Luke 12:56 - Ye hypocrites, ye can discern the face of the sky and of the earth; but how is it that ye do not discern this time? Luke 21:35 - For as a snare shall it come on all them that dwell on the face of the whole earth. DEBUNKED: Flat-earthers imply the face of something equals "flat." In their minds, when the Bible says "the face of the earth" or the "face of the waters," they think the Bible must be describing a flat disk or flat earth. However, flat-earthers are flat-out wrong! In every Old Testament verse listed in this section, the word for "face" is panim or paneh (Strong's H6440) which affirms the surface of something and would not support the concept of H6440 being a flat earth or flat disk. If you want to get technical, the root word for H6440 is the verb panah (Strong's H6437) and it means to turn. Therefore, this would support the turning face of the earth and waters of the earth more than it would a flat, immovable, earth. All the verses in this section from the New Testament, use the Greek word "prosópon" (Strong's G4383) and that word means the face, surface, or appearance of something. Like the Hebrew, this Greek word would not give support to a flat earth. The face of the earth, the face of the ground, and the face of the waters are the surfaces of those things. The face of the earth (dry land), is the surface of the land. Therefore, when you see the land on a globe, you see the surface (face) of the land (earth). When you look at the ocean water, you see the surface (face) of the water on a globe. However, for each of these (dry land and water), there is further depth to it and like a human face that has curvature the Hebrew and Greek words for "face" would allow for a surface to have curvature. When you look at the sky, you can see the surface of the clouds and the atmosphere as a backdrop, seeing as far as the limit of your eyesight will allow. Beyond the visible atmosphere, there is further depth as you rise in altitude. The same occurs with the evening sky. When you look up at the evening sky, you see the stars and planets that "appear" to be the surface of space, but space has depth beyond what we observe with our eyes. The verses listed above in this section would all affirm a face that has a curvature so it would also support the curvature of a globe. However, these verses and the associated Hebrew and Greek words for "face," do not confirm the idea of a flat earth. Genesis 13:17 - Arise, walk through the land in the length of it and in the breadth of it; for I will give it unto thee. Isaiah 8:8 - And he shall pass through Judah; he shall overflow and go over, he shall reach even to the neck; and the stretching out of his wings shall fill the breadth of thy land, O Immanuel. Revelation 20:9 - And they went up on the breadth of the earth, and compassed the camp of the saints about, and the beloved city: and fire came down from God out of heaven, and devoured them. DEBUNKED: Wrong! These three verses are speaking of the dry land (what God calls the earth in Genesis chapter 1). The dry land on a globe can be measured for its length and width. If you own a home, then you should be familiar with the length and width of your land (property). These verses don't speak about the shape of the globe and therefore don't prove the flat earth or debunk the globe. Flat-Earthers Debunked! Flat Earther's Claim: The Earth And Space Cannot Be Measured. Therefore, They Believe The Flat Earth Model is True and The Globe is Unscriptural. Job 11:8-9 - It is as high as heaven; what canst thou do? deeper than hell; what canst thou know? The measure thereof is longer than the earth, and broader than the sea. Job 38:5 - Who hath laid the measures thereof, if thou knowest? or who hath stretched the line upon it? Proverbs 25:3 - The heaven for height, and the earth for depth, and the heart of kings isunsearchable. Jeremiah 31:37 (Duplicate) - ​Thus saith the LORD; If heaven above can be measured, and the foundations of the earth searched out beneath, I will also cast off all the seed of Israel for all that they have done, saith the LORD. DEBUNKED: This doesn't debunk the globe because people that know the earth is a globe also understand space goes far beyond our ability to measure it. Actually, this claim that flat-earthers make against the globe end up debunking the flat earth model. Flat-earthers claim the earth's atmosphere and space are contained under a dome that ranges in measurement from 75 miles to 3,100 miles high. Flat-earthers are the ones that should be concerned that the Bible says space cannot be measured. Flat-earthers defy the Bible and claim space can be measured by the height and width of their dome. Job 37:10 - By the breath of God frost is given: and the breadth of the waters is straitened. Psalm 136:6 - To him that stretched out the earth above the waters: for his mercy endureth for ever. Let's take a look at Job 37:10 and see how wrong flat-earthers are when it comes to the Bible. It's about to get embarrassing for flat-earthers. Job 37:10 says, "By the breath of God frost is given: and the breadth of the waters is straitened." Flat-earthers think this means God straightened the waters, so there is no curved water on planet earth. In their minds, Job 37:10 debunks the globe. Case closed! Okay, so, let's re-open the case and find Job 37:10 not guilty of being a flat earth verse and free it from being held captive on the flat-earthers proof-text list. "By the breath of God frost is given..." The word for frost is the Hebrew word: "qerach" Strong's H7140 and it means frost or ice. So, clearly, if there is ice and frost then that means it's cold and freezing. "AND the breadth of the waters is straitened" We have freezing, ice, and frost and the waters are "straitened." Why do you think it's significant that the Bible mentions frost and ice before it mentions the water is straitened? Because the Hebrew text is telling us the water is frozen! The word "straitened" is the English translation for the Hebrew word: "bemutsaq" Strong's H4164 and that Hebrew word means frozen, constrained, narrow, restricted, or anguish. Neither the Hebrew word or the entire passage has anything to do with God making the water straight on a flat earth, it means the waters are frozen. Now here is the embarrassing part for flat-earthers that will set Job 37:10 totally free from being labeled a flat earth verse. The words strait, straitened, or straitness, are not the same as the words straight, straightened, or straightness. Did you get that? The word straight means something is level and not curved. However, the word "strait" means a narrow passage or waterway like the Strait of Gibraltar. Straits is the plural form of strait and it means distress or difficulty. Have you ever heard the phrase: "I am in dire straits," well that phrase means you're is severe distress or difficulty. So, the frozen waters in this passage are under stress (straitened). So, Job 37:10 can't be used to prove the water is "straight" like flat-earthers say because the verse does not use the word straightened, it uses the word straitened which are two totally different words with two totally different meanings. Apparently, flat-earthers not only struggle to understand the bible but now struggle to understand the English language. After their debacle with Job 37:10, flat-earthers then use Psalm 136:6 to claim God cannot stretch out the dry land across the globe. However, we already covered this topic in our debunk about the foundations of the earth section above. Psalm 136:6 aligns perfectly with our explanation of the foundations of the earth and the tie to the land under the ocean waters. God is more than able to make the dry land and stretch it out over the waters on a globe without a problem. Are there verses that prove curvature? Yes, check it out here. Jeremiah 6:22 - Thus saith the LORD, Behold, a people cometh from the north country, and a great nation shall be raised from the sides of the earth. DEBUNKED: The Hebrew word for "sides" is “miyarkete” from Strong's H3411 and it means not only sides but also the remote parts, the rear, the border, and the coast. In fact, Jeremiah uses the same exact Hebrew word in other passages, and those passages are translated in the King James as "coasts." Jeremiah 25:32 - "Thus saith the LORD of hosts, Behold, evil shall go forth from nation to nation, and a great whirlwind shall be raised up from the coasts of the earth." Jeremiah 31:8 - "Behold, I will bring them from the north country, and gather them from the coasts of the earth, and with them the blind and the lame, the woman with child and her that travaileth with child together: a great company shall return thither." Jeremiah 50:41 - "Behold, a people shall come from the north, and a great nation, and many kings shall be raised up from the coasts of the earth." In the proper context, this Hebrew word means, the remote parts of the dry land, from coast-to-coast, from one side to the other. If you travel from one side of the country to the other side, it doesn't mean the earth is flat. If you traveled from the east coast of the U.S. to the west coast, it doesn't prove you live on a flat earth. This verse does not support the idea that the flat earth has literal sides running down the square flat earth model. This verse is clearly referring to the coasts or extreme parts of the dry land (earth). This verse proves nothing unless flat-earthers want to claim "a great nation shall be raised from the sides of the [flat] earth," from no man's land, outside their dome, from the outer side of their square earth. If they did, they would be taking this verse far beyond what they are already twisting it from its original message. Joshua 13:27 - And in the valley, Betharam, and Bethnimrah, and Succoth, and Zaphon, the rest of the kingdom of Sihon king of Heshbon, Jordan and his border, even unto the edge of the sea of Chinnereth on the other side Jordan eastward. DEBUNKED: Seriously? Are flat-earthers are going to use this verse to debunk the globe by claiming the seas have an edge, therefore in their mind the earth is flat? This verse is not talking about the seas all around the world. This verse is talking about the edge of the Sea of Chinnereth, which is also known as the Sea of Galilee in Israel. A local body of water. What are the "edges" of the sea? It's when the ends of the water meet the ends of the dry land. No proof of flat earth with this scripture. Hebrews 11:3 - ​Through faith we understand that the worlds were framed by the word of God, so that things which are seen were not made of things which do appear. DEBUNKED: Hebrews 11:3 says: " the worlds were framed by the word of God." Notice the English version says "worlds" as in plural and not just the earth. Actually, in the original Greek text the word "aiōnas" is used from Strong's G165 and it means a span of time, the ages, an era of time, or eternity. This verse is not talking about the earth alone. The verse is more universal and encompasses the era of humankind, creation, and beyond. So, it's both time and creation itself that God framed. The Greek word for framed is "katērtisthai" from Strong's G2675 which means to perfectly adjust, fix, restore, prepare, or perfect something. So, what the verse is saying is that God prepared and perfected his creation by his words. Does this verse debunk the globe? No! Does this verse prove the earth is flat? No! DEBUNKED: Flat-earthers make a big deal about the fact the Matthew, Tyndale, and Great Bibles read "flat earth" instead of "open fields" as seen in the King James and other translations. Some translations also read "Face of the earth" or "face of the ground" So, are the Matthew, Tyndale, and Great Bibles confirming the earth is flat? Not at all. Flat-earthers in their hysterics to find proof for their flawed teachings are elevating this into something it's not. Flat-earthers need to calm down, take a deep breath, and pay attention. This verse has nothing to do with planet earth. So, just because the Matthew Tyndale, and Great Bibles say "flat earthe" or "flatt erthe" (flat earth), it does not prove planet earth is flat. Here's why, because this verse is not talking about the planet as a whole, it's talking about a field where David's army was camping. In the original Hebrew text, the word "haśśāḏeh" does not mean earth. This word occurs about 131 times in the Old Testament and almost everytime it occurs it means "field" or "fields." Sometimes it's translated as wild, country, or the ground. The word for "flat" in the Matthew, Tyndale, and Great bibles is a translation of the Hebrew word "pənê," from Strong's H6440 and it means "open." H6440 is the word for face or surface -- Not Flat. Even the Septuagint translates this word as open or face -- Not Flat. In addition, the translators of the Matthew, Tyndale, and Great Bibles are using the word earth in the context of the dry land (Genesis 1:10). Therefore, the obvious conclusion is the translators of these three Bibles are trying to get across the message that David's army was sleeping flat on the ground of the field. This is why Uriah did not feel right sleeping in the comfort of his bed at home while his fellow warriors were sleeping on a hard ground. There is nothing wrong with their translation unless you want to exploit it and turn it into a different message from what the translators intended it to be, just to push an agenda. Nevertheless, the original text and the majority of translations show that David's army slept in an open field or on the face (surface) of the ground. Therefore, there is no evidence here that the planet is flat. Job 12:15- Behold, he withholdeth the waters, and they dry up: also he sendeth them out, and they overturn the earth. Isaiah 24:1 - Behold, the LORD maketh the earth empty, and maketh it waste, and turneth it upside down, and scattereth abroad the inhabitants thereof. DEBUNKED: Flat-earthers forget the globe is tilted on its axis and can be tilted further or be overturned like you turn a ball. In fact, this may have happened during the global flood. However, more than likely, Job 12:15 is describing a destructive flood over the land and not the overturning of the entire planet. Isaiah 24, appears to be describing the destruction that will occur during the tribulation period and the great battle when Christ returns to the earth. During this period there will be a lot of earthquakes, so the earth (dry land), will be overturned, break open, teeter, and sway. When we read the Book of Revelation we can be assured planet earth will not be overturned, so no worries. However, it amazes me that flat-earthers would argue how their flat earth can be overturned but the globe can't. They do it in a tone that says their earth is better than the globe earth. It's like a kid arguing his dad is stronger than your dad. How silly can they get? ​Did they really think their whole statement out before they wrote it? First, they claim their flat earth is fixed and can't be moved, so how will it overturn? Second, did they ever get an image in their head what it would look like if their flat earth was overturned? Genesis 6:12 -And God looked upon the earth, and, behold, it was corrupt; for all flesh had corrupted his way upon the earth. Genesis 6:17 - And, behold, I, even I, do bring a flood of waters upon the earth, to destroy all flesh, wherein is the breath of life, from under heaven; and every thing that is in the earth shall die. Genesis 7:12 - And the rain was upon the earth forty days and forty nights. Genesis 7:24 - And the waters prevailed upon the earth an hundred and fifty days. Genesis 8:17 - Bring forth with thee every living thing that is with thee, of all flesh, both of fowl, and of cattle, and of every creeping thing that creepeth upon the earth; that they may breed abundantly in the earth, and be fruitful, and multiply upon the earth. Genesis 9:2 - And the fear of you and the dread of you shall be upon every beast of the earth, and upon every fowl of the air, upon all that moveth upon the earth, and upon all the fishes of the sea; into your hand are they delivered. Job 38:24: By what way is the light parted, which scattereth the east wind upon the earth? Ecclesiastes 11:2 - Give a portion to seven, and also to eight; for thou knowest not what evil shall be upon the earth. Matthew 23:35 - That upon you may come all the righteous blood shed upon the earth, from the blood of righteous Abel unto the blood of Zacharias son of Barachias, whom ye slew between the temple and the altar. Romans 9:28 - For he will finish the work, and cut it short in righteousness: because a short work will the Lord make upon the earth. Revelation 3:10 - Because thou hast kept the word of my patience, I also will keep thee from the hour of temptation, which shall come upon all the world, to try them that dwell upon the earth. Revelation 16:2 - And the first went, and poured out his vial upon the earth; and there fell a noisome and grievous sore upon the men which had the mark of the beast, and upon them which worshipped his image. DEBUNKED: You can certainly be upon or on the globe earth because Matthew 23:35 says the blood of Abel was upon the earth (land). You can be under or beneath the globe earth because Deuteronomy 4:18 says fish in the ocean are considered beneath the earth. Genesis 9:14 says, "And it shall come to pass, when I bring a cloud over the earth, that the bow shall be seen in the cloud." So, since planes can fly in and above the clouds, I guess there's no problem being over the globe earth either. See how easy it was to debunk this flat-earther claim? If flat-earthers, would just read their Bible and apply common sense to what they read, then they would have seen the silliness of bringing up this claim against the globe earth. Job 38:14 - It is turned as clay to the seal; and they stand as a garment. DEBUNKED: Wrong! The flat earth is not a disk. The flat earth is better represented as a four-cornered brick. Flat-earthers can't claim their world has four corners, foundations, pillars, sides, and edges one moment and then say it's a flat disk the next. The biblical text says: "the four corners of the earth" which means the corners are just as much part of the earth as the ground people walk on. And since flat-earthers believe the corners are literal corners, then that means their literal earth has literal corners which makes their world a square and not a round disk. If flat-earthers dare argue their corners are not part of the earth, then they are arguing against their own interpretation of the biblical text. However, we're making flat-earthers stick to what they preach. They can't use double-talk here. They created this flat-earth model and supposedly matched it to the Bible, so we will hold them to that model. They're not going to morph their flat earth model into whatever they need to fit a scripture or win a debate with us. Job 38:14 -- Is not talking about a four-square brick earth and Job 38:14 is using the analogy of the ancient seals that rolled across the clay. See our teaching on this here. Proverbs 8:27 -- Is not talking about a disk (which the flat earth is not), this verse is actually talking about the curvature of the earth and horizon. Isaiah 40:22 -- Is not talking about a four-cornered brick planet, it's talking above the curvature and rotation of the globe. To learn more about why Proverbs 8:27 and Isaiah 40:22 does not support flat-earther doctrine, please see our teaching here and the video posted below. Genesis 1:6-8 - And God said, Let there be a firmament in the midst of the waters, and let it divide the waters from the waters. And God made the firmament, and divided the waters which were under the firmament from the waters which were above the firmament: and it was so. And God called the firmament Heaven. And the evening and the morning were the second day. God called the firmament the sky/heaven/space. He didn't call it the dome of the sky or dome of the earth. Genesis 1:14-19- And God said, Let there be lights in the firmament of the heaven to divide the day from the night; and let them be for signs, and for seasons, and for days, and years: And let them be for lights in the firmament of the heaven to give light upon the earth: and it was so. And God made two great lights; the greater light to rule the day, and the lesser light to rule the night: he made the stars also. And God set them in the firmament of the heaven to give light upon the earth, And to rule over the day and over the night, and to divide the light from the darkness: and God saw that it was good. And the evening and the morning were the fourth day. NOTE: In the flat earth model, flat-earthers place the sun and moon under their firmament and NOT in the firmament like they do with the stars. Their model does not match the biblical creation account. The sun, moon, and stars all have to be in the same location (in the firmament). So the sun and moon can't be freely floating over the earth while the stars are stuck in the walls of their firmament. Genesis 1:20 - And God said, Let the waters bring forth abundantly the moving creature that hath life, and fowl that may fly above the earth in the open firmament of heaven. Open firmament and not a closed dome. Job 9:8 - Which alone spreadeth out the heavens, and treadeth upon the waves of the sea. Heaven is an expanse not a dome! Job 26:7 - He stretcheth out the north over the empty place, and hangeth the earth upon nothing. Heaven is an expanse not a dome! Job 28:24 - For he looketh to the ends of the earth, and seeth under the whole heaven; God can see everthing but that fact does not prove the earth is flat. Job 37:18 - Hast thou with him spread out the sky, which is strong, and as a molten looking glass? Note: The word for sky used in this verse is the Hebrew word for clouds and it means powder and vapor, so it would be hard to claim powder and vapor represents a solid dome. The word for strong also means mighty and loud. Notice it says "as a" and not "is a" molten looking glass or metal mirror. This is a simile and it does not speak about a dome. This verse is talking about a hot desert storm with thick clouds, dust, and loud thunder. Psalm 19:1 - To the chief Musician, A Psalm of David. The heavens declare the glory of God; and the firmament sheweth his handywork. His handywork is not a dome, it's the great expanse. Psalm 150:1 - Praise ye the LORD. Praise God in his sanctuary: praise him in the firmament of his power. His expanse is praise worthy, but this scripture does not prove a dome. Isaiah 44:24 - Thus saith the LORD, thy redeemer, and he that formed thee from the womb, I amthe LORD that maketh all things; that stretcheth forth the heavens alone; that spreadeth abroad the earth by myself" Again, God stretched the heavens, he did not bend the sky to create a closed dome. Isaiah 45:12 -I have made the earth, and created man upon it: I, even my hands, have stretched out the heavens, and all their host have I commanded. The Bible continues to show the heavens are stretched and not a dome. Ezekiel 1:22-28 - And the likeness of the firmament upon the heads of the living creature was as the colour of the terrible crystal, stretched forth over their heads above. And under the firmament were their wings straight, the one toward the other: every one had two, which covered on this side, and every one had two, which covered on that side, their bodies. And when they went, I heard the noise of their wings, like the noise of great waters, as the voice of the Almighty, the voice of speech, as the noise of an host: when they stood, they let down their wings. And there was a voice from the firmament that was over their heads, when they stood, and had let down their wings. And above the firmament that was over their heads was the likeness of a throne, as the appearance of a sapphire stone: and upon the likeness of the throne was the likeness as the appearance of a man above upon it. And I saw as the colour of amber, as the appearance of fire round about within it, from the appearance of his loins even upward, and from the appearance of his loins even downward, I saw as it were the appearance of fire, and it had brightness round about. As the appearance of the bow that is in the cloud in the day of rain, so was the appearance of the brightness round about. This was the appearance of the likeness of the glory of the LORD. And when I saw it, I fell upon my face, and I heard a voice of one that spake. See our note below. Ezekiel 10:1 -Then I looked, and, behold, in the firmament that was above the head of the cherubims there appeared over them as it were a sapphire stone, as the appearance of the likeness of a throne. See Our note below. Daniel 12:3 -And they that be wise shall shine as the brightness of the firmament; and they that turn many to righteousness as the stars for ever and ever. This is only describing the firmament (the sky) as being bright, which it is during the day. This does not prove a dome. Amos 9:6 -It is he that buildeth his stories in the heaven, and hath founded his troop in the earth; he that calleth for the waters of the sea, and poureth them out upon the face of the earth: The LORD is his name. See our note below. Jeremiah 10:12 - He hath made the earth by his power, he hath established the world by his wisdom, and hath stretched out the heavens by his discretion. Agree it's an expanse - Not a dome! Jeremiah 51:15 - He hath made the earth by his power, he hath established the world by his wisdom, and hath stretched out the heaven by his understanding. Agree it's an expanse - Not a dome! DEBUNKED: In many English versions of the Bible, the word “firmament” is used as a translation for the Hebrew word “raqia” Strong’s H7549, which is found In Genesis 1:6, 7, 8, 14, 15, 17, and 20. Raqia means to expand or stretch something. So, in the original Hebrew text of Genesis the “expanse” of the heavens/space, never was or never will mean God created a dome on the second day of creation. Even the verb “raqa” Strong’s H7554 means the act of spreading out or stretching something. If the firmament/expanse is really a dome or arch as flat-earthers claim, then the Hebrew word “Kippah” [כפה כיפה] (dome)  would have been used in the Genesis narrative and not Raqia. Kippah is derived from the Hebrew words “kaphaph,” Strong’s H3721, which means to bend or bow something. Also, the Hebrew word for an arch was not used in Genesis. Therefore, we have two Hebrew words that would have fit the concept of a dome perfectly, but they’re not used in Genesis. Why not? Because the sky above us is not a dome. Flat Earthers Debunked! The Bible frequently recalls how God spread out or expanded the heavens (space). This spreading out, is the opposite of bending and enclosing space over the earth as a dome. Therefore, the choice of Hebrew words in Genesis, speaks against the concept of a dome over the earth. God created an expansive, open universe to show his greatness and that’s what we observe – Not a closed dome over us! Flat Earthers Debunked! The Bible says the firmament begins at the horizon, at the face (surface) of the waters. But the flat earth dome supposedly begins beyond their ice wall. He created a horizon (the earths curve/ the horizon) between the waters below (the sea) and the waters above (the sky). The horizon which is at the earth's curve is the end of the earth and start of the sky/space heavens. What did God name the firmament? Heaven! (Genesis 1:8). Where do the birds fly? In the open firmament/heavens/sky (Genesis 1:20). However, with the flat earth model the start of their firmament/sky/space is not on the ocean waters. Their dome is beyond some supposed ice wall in flat-earther no man's land past Antarctica, but what we observe is the sky starts at our horizon. -- Flat-Earthers Debunked! Founded could mean appoint, ordain, or establish. Exodus 12:22 - A bunch of Hyssops -- Not an arch, vault, or dome! 2 Samuel 2:25 - Troop -- Not an arch, vault, or dome! Isaiah 58:6 - Burdens/Bands -- Not an arch, vault, or dome! Amos 9:6 - So, why should Amos 9:6 be different from how the word is translated in other parts of the Bible? Why would translators need to go outside the Bible and outside the Hebrew language to translate the meaning of "aguddah," based on the Arab language? Aguddah is clearly defined in the Bible as a bunch, troop, or band, so we have examples of what the Hebrew should be translated as. We don't need understanding from another language. Although Hebrew and Arabic are both Semitic languages and have some similarities, it should be made clear that they are two very different languages. It's not like British English and American English in comparison. It's more like comparing French with Italian. Although, some Hebrew and Arab speakers will say the gap between Hebrew and Arabic are wider than a comparison between French and Italian. Therefore, by looking to the Arab language for the definition of a Hebrew word, we can see it caused "aguddah" in Amos 9:6 to be translated differently than the Hebrew understanding of the word. The King James translation of "aguddah" (Troops) is more accurate to the original Hebrew text. Another issue with using "ijad" to define the Hebrew "aduddah" is that the common definition of "ijad" is invention, discovery, becoming, rendering capable, or giving existence to something. - A Dictionary of Persian, Arabic, and English by John Richardson, 1810. Therefore, there's a lot of twisting of words and bending in order to make this dome, arch, or vault concept fit. It's a lot easier to just accept the examples of the Bible rather than introduce a new concept foreign to the scriptures and the Hebrew language. The Context of the chapter confirms aguddah is "troops"
Because of the context of Amos chapter 9, a chapter that speaks of judgment, it’s fitting that God would say he has his "troops" on the earth, with the troops (aguddah) being a band of people (2 Samuel 2:25) or army troops. Amos 9:5 - "And the Lord GOD of hosts is he that toucheth the land, and it shall melt, and all that dwell therein shall mourn: and it shall rise up wholly like a flood; and shall be drowned, as by the flood of Egypt." Amos 9:6 - "It is he that buildeth his stories in the heaven, and hath founded his troop in the earth; he that calleth for the waters of the sea, and poureth them out upon the face of the earth: The LORD is his name." Amos 9:7 - "Are ye not as children of the Ethiopians unto me, O children of Israel? saith the LORD. Have not I brought up Israel out of the land of Egypt? and the Philistines from Caphtor, and the Syrians from Kir?" Amos 9:8 - "Behold, the eyes of the Lord GOD are upon the sinful kingdom, and I will destroy it from off the face of the earth; saving that I will not utterly destroy the house of Jacob, saith the LORD." Amos 9:9 - "For, lo, I will command, and I will sift the house of Israel among all nations, like as corn is sifted in a sieve, yet shall not the least grain fall upon the earth." What army will God command to do this? Amos 9:6 explains: “And hath founded (established/ordained) his troop in the earth…” (A dome, arch, or vault does not fit the context). Does God use foreign armies (troops)? Yes! So, God can have troops he ordains as instruments of punishment against the sinful of Israel. Therefore, according to the Hebrew text, “troop” as in a band of people, is the accurate translation for Amos 9:6, which means the idea of a dome is not supported by the Hebrew text or the established biblical definition of the word based on Hebrew and not Arabic. It should be noted that the Septuagint, The Greek Old Testament, has a completely different reading for Amos 9:6. With all the variant translations it would be very silly for flat-earthers to claim Amos 9:6 is solid evidence for their flat earth dome. The evidence against the dome is stronger than any support for a dome. The biggest point against this verse being translated as an arch, vault, or dome is that translators must use Arabic to justify their translation and ignore three perfectly good biblical examples of how "aggudah" should be translated. The context of Amos chapter 9 supports the "troop" translation, not the vault or dome translation and the Septuagint, the Greek translation of an earlier Hebrew text states God established his promise on the earth. Even the Septuagint text is more in line with the context of Amos chapter 9 than the idea of a dome or vault over the earth. For those reasons and others, this verse is not proof of a dome. Ezekiel 1:1 Now it came to pass in the thirtieth year, in the fourth month, in the fifth day of the month, as I was among the captives by the river of Chebar, that the heavens were opened, and I saw visions of God. - Ezekiel saw a vision of Cherubim and wheels, while on the earth along a river. Ezekiel 1:12 And they went every one straight forward: whither the spirit was to go, they went; and they turned not when they went. - The creatures with a firmament (expanse) over their heads move. -- This is not a dome over the earth! Ezekiel 1:15 & 19 Now as I beheld the living creatures, behold one wheel upon the earth by the living creatures, with his four faces. And when the living creatures went, the wheels went by them: and when the living creatures were lifted up from the earth, the wheels were lifted up - Again, we see the living creatures and wheels moving, so this is not a fixed dome over the earth. Ezekiel 1:22-28 "And the likeness of the firmament (EXPANSE) upon the heads of the living creature was as the colour of the terrible crystal, stretched forth over their heads above. And under the firmament were their wings straight, the one toward the other: every one had two, which covered on this side, and every one had two, which covered on that side, their bodies. And when they went, I heard the noise of their wings, like the noise of great waters, as the voice of the Almighty, the voice of speech, as the noise of an host: when they stood, they let down their wings. And there was a voice from the firmament that was over their heads, when they stood, and had let down their wings. And above the firmament that was over their heads was the likeness of a throne, as the appearance of a sapphire stone: and upon the likeness of the throne was the likeness as the appearance of a man above upon it. And I saw as the colour of amber, as the appearance of fire round about within it, from the appearance of his loins even upward, and from the appearance of his loins even downward, I saw as it were the appearance of fire, and it had brightness round about. As the appearance of the bow that is in the cloud in the day of rain, so was the appearance of the brightness round about. This was the appearance of the likeness of the glory of the LORD. And when I saw it, I fell upon my face, and I heard a voice of one that spake". - In this vision, we see a lot of "likeness." This means Ezekiel had to use figurative language to explain what he saw in the vision. He said there was a "likeness of the firmament (expanse) and this expanse had the color of the terrible (bright) crystal. Clear and bright. Psalm 18:10 - "And he rode upon a cherub, and did fly: yea, he did fly upon the wings of the wind." Psalm 104:3 - "Who layeth the beams of his chambers in the waters: who maketh the clouds his chariot: who walketh upon the wings of the wind:"
Jeremiah 4:13 - "Behold, he shall come up as clouds, and his chariots shall be as a whirlwind: his horses are swifter than eagles. Woe unto us! for we are spoiled." Exodus 24:10 - "And they saw the God of Israel: and there was under his feet as it were a paved work of a sapphire stone, and as it were the body of heaven in his clearness." Ezekiel saw the chariot of God moving at his location and over Israel in a vision. The expanse he saw below God's throne, appeared like and was bright like the expanse/firmament of the sky, but wasn't the firmament/expanse. This description also matches the paving seen under God in Exodus 24:10. However, none of this has anything to do with proving the earth has a dome or proving the earth is flat because these things that God rode on and traveled around the earth with, was not the fictional dome of flat-earthers. Ezekiel description and other verses only use a comparison of the sky because of the skies clearness and brightness. The daytime sky is both bright and clear. Genesis 15:12 - And when the sun was going down, a deep sleep fell upon Abram; and, lo, an horror of great darkness fell upon him. Where would the sun go down to on the flat earth? Would it touch the earth? Genesis 15:17 - And it came to pass, that, when the sun went down, and it was dark, behold a smoking furnace, and a burning lamp that passed between those pieces. How can a sun "go down" on a flat earth? It can't because a flat earth sun model is on a fixed course circling the flat earth. Genesis 19:23 - The sun was risen upon the earth when Lot entered into Zoar. Where does the sun rise from on a flat earth? Genesis 28:11 - And he lighted upon a certain place, and tarried there all night, because the sun was set; and he took of the stones of that place, and put them for his pillows, and lay down in that place to sleep. The flat earth sun can't set below the horizon. Genesis 29:7 - And he said, Lo, it is yet high day, neither is it time that the cattle should be gathered together: water ye the sheep, and go and feed them. Genesis 32:31 - And as he passed over Penuel the sun rose upon him, and he halted upon his thigh. The flat earth sun can't rise above the horizon from the top first and bottom last. Exodus 17:12 - But Moses' hands were heavy; and they took a stone, and put it under him, and he sat thereon; and Aaron and Hur stayed up his hands, the one on the one side, and the other on the other side; and his hands were steady until the going down of the sun. The sun cannot go down below the horizon on a flat earth. Exodus 22:26 - If thou at all take thy neighbour's raiment to pledge, thou shalt deliver it unto him by that the sun goeth down: Sun can't go down on a flat earth below the horizon. Leviticus 22:7 - And when the sun is down, he shall be clean, and shall afterward eat of the holy things; because it is his food. The sun can't go down below the horizon on a flat earth. Numbers 2:3 - And on the east side toward the rising of the sun shall they of the standard of the camp of Judah pitch throughout their armies: and Nahshon the son of Amminadab shall be captain of the children of Judah. Sun on flat earth cannot rise from the top first. Numbers 21:11 - And they journeyed from Oboth, and pitched at Ijeabarim, in the wilderness which is before Moab, toward the sunrising. The sun can't rise or set below the horizon on a flat earth model. This is true for all the other scriptures below. Numbers 34:15 - The two tribes and the half tribe have received their inheritance on this side Jordan near Jericho eastward, toward the sunrising. Deuteronomy 11:30 - Are they not on the other side Jordan, by the way where the sun goeth down, in the land of the Canaanites, which dwell in the champaign over against Gilgal, beside the plains of Moreh? Deuteronomy 16:6 - But at the place which the LORD thy God shall choose to place his name in, there thou shalt sacrifice the passover at even, at the going down of the sun, at the season that thou camest forth out of Egypt. Deuteronomy 23:11 - But it shall be, when evening cometh on, he shall wash himself with water: and when the sun is down, he shall come into the camp again. Deuteronomy 24:13 - In any case thou shalt deliver him the pledge again when the sun goeth down, that he may sleep in his own raiment, and bless thee: and it shall be righteousness unto thee before the LORD thy God. Deuteronomy 24:15 - At his day thou shalt give him his hire, neither shall the sun go down upon it; for he is poor, and setteth his heart upon it: lest he cry against thee unto the LORD, and it be sin unto thee. Joshua 1:4 - From the wilderness and this Lebanon even unto the great river, the river Euphrates, all the land of the Hittites, and unto the great sea toward the going down of the sun, shall be your coast. Joshua 1:15 - Until the LORD have given your brethren rest, as he hath given you, and they also have possessed the land which the LORD your God giveth them: then ye shall return unto the land of your possession, and enjoy it, which Moses the LORD'S servant gave you on this side Jordan toward the sunrising. Joshua 8:29 - And the king of Ai he hanged on a tree until eventide: and as soon as the sun was down, Joshua commanded that they should take his carcase down from the tree, and cast it at the entering of the gate of the city, and raise thereon a great heap of stones, that remaineth unto this day. Joshua 10:27 - And it came to pass at the time of the going down of the sun, that Joshua commanded, and they took them down off the trees, and cast them into the cave wherein they had been hid, and laid great stones in the cave's mouth, which remain until this very day. Joshua 13:5 - And the land of the Giblites, and all Lebanon, toward the sunrising, from Baalgad under mount Hermon unto the entering into Hamath. Joshua 19:34 - And then the coast turneth westward to Aznothtabor, and goeth out from thence to Hukkok, and reacheth to Zebulun on the south side, and reacheth to Asher on the west side, and to Judah upon Jordan toward the sunrising. Judges 5:31 - So let all thine enemies perish, O LORD: but let them that love him be as the sun when he goeth forth in his might. And the land had rest forty years. Judges 9:33 - And it shall be, that in the morning, as soon as the sun is up, thou shalt rise early, and set upon the city: and, behold, when he and the people that is with him come out against thee, then mayest thou do to them as thou shalt find occasion. Judges 14:18 - And the men of the city said unto him on the seventh day before the sun went down, What is sweeter than honey? and what is stronger than a lion? And he said unto them, If ye had not plowed with my heifer, ye had not found out my riddle. Judges 19:14 - And they passed on and went their way; and the sun went down upon them when they were by Gibeah, which belongeth to Benjamin. Judges 20:43 - Thus they inclosed the Benjamites round about, and chased them, and trode them down with ease over against Gibeah toward the sunrising. 2 Samuel 2:24 - Joab also and Abishai pursued after Abner: and the sun went down when they were come to the hill of Ammah, that lieth before Giah by the way of the wilderness of Gibeon. 2 Samuel 3:35 - And when all the people came to cause David to eat meat while it was yet day, David sware, saying, So do God to me, and more also, if I taste bread, or ought else, till the sun be down. 2 Samuel 23:4 - And he shall be as the light of the morning, when the sun riseth, even a morning without clouds; as the tender grass springing out of the earth by clear shining after rain. 1 Kings 22:36 - And there went a proclamation throughout the host about the going down of the sun, saying, Every man to his city, and every man to his own country. 2 Chronicles 18:34 - And the battle increased that day: howbeit the king of Israel stayed himself up in his chariot against the Syrians until the even: and about the time of the sun going down he died. Job 9:7 - Which commandeth the sun, and it riseth not; and sealeth up the stars. Psalm 19:5 - Which is as a bridegroom coming out of his chamber, and rejoiceth as a strong man to run a race. Where is this chamber/dwelling place? It's not floating over the earth because the original Hebrew text says its located at the extreme end of space (heaven). Psalm 50:1 - A Psalm of Asaph. The mighty God, even the LORD, hath spoken, and called the earth from the rising of the sun unto the going down thereof. Psalm 104:19 - He appointed the moon for seasons: the sun knoweth his going down. Psalm 104:22 - The sun ariseth, they gather themselves together, and lay them down in their dens. Psalm 113:3 -From the rising of the sun unto the going down of the same the LORD'S name is to be praised. Isaiah 13:10 - For the stars of heaven and the constellations thereof shall not give their light: the sun shall be darkened in his going forth, and the moon shall not cause her light to shine. Isaiah 41:25 - I have raised up one from the north, and he shall come: from the rising of the sun shall he call upon my name: and he shall come upon princes as upon morter, and as the potter treadeth clay. Isaiah 45:6 - That they may know from the rising of the sun, and from the west, that there isnone beside me. I am the LORD, and there is none else. Isaiah 59:19 - So shall they fear the name of the LORD from the west, and his glory from the rising of the sun. When the enemy shall come in like a flood, the Spirit of the LORD shall lift up a standard against him. Isaiah 60:20 - ​Thy sun shall no more go down; neither shall thy moon withdraw itself: for the LORD shall be thine everlasting light, and the days of thy mourning shall be ended. Jeremiah 15:9 - She that hath borne seven languisheth: she hath given up the ghost; her sun is gone down while it was yet day: she hath been ashamed and confounded: and the residue of them will I deliver to the sword before their enemies, saith the LORD. Daniel 6:14 - Then the king, when he heard these words, was sore displeased with himself, and set his heart on Daniel to deliver him: and he laboured till the going down of the sun to deliver him. Jonah 4:8 - And it came to pass, when the sun did arise, that God prepared a vehement east wind; and the sun beat upon the head of Jonah, that he fainted, and wished in himself to die, and said, It is better for me to die than to live. Micah 3:6 - Therefore night shall be unto you, that ye shall not have a vision; and it shall be dark unto you, that ye shall not divine; and the sun shall go down over the prophets, and the day shall be dark over them. Nahum 3:17 - "Thy crowned are as the locusts, and thy captains as the great grasshoppers, which camp in the hedges in the cold day, but when the sun ariseth they flee away, and their place is not known where they are. Malachi 4:2 - "But unto you that fear my name shall the Sun of righteousness arise with healing in his wings; and ye shall go forth, and grow up as calves of the stall." Malachi 1:11 - "For from the rising of the sun even unto the going down of the same my name shall be great among the Gentiles; and in every place incense shall be offered unto my name, and a pure offering: for my name shall be great among the heathen, saith the LORD of hosts." Matthew 5:45 - "That ye may be the children of your Father which is in heaven: for he maketh his sun to rise on the evil and on the good, and sendeth rain on the just and on the unjust." Matthew 13:6 - "And when the sun was up, they were scorched; and because they had no root, they withered away." Mark 1:32 - "And at even, when the sun did set, they brought unto him all that were diseased, and them that were possessed with devils." Mark 16:2 - "And very early in the morning the first day of the week, they came unto the sepulchre at the rising of the sun." Ephesians 4:26 - "Be ye angry, and sin not: let not the sun go down upon your wrath"
James 1:11 - "For the sun is no sooner risen with a burning heat, but it withereth the grass, and the flower thereof falleth, and the grace of the fashion of it perisheth: so also shall the rich man fade away in his ways." DEBUNKED: It's funny to see flat-earthers post scriptures that say the sun rises and sets when it's impossible for the sun to rise and set under their flat earth model. They claim their sunrise and sunset is the result of a vanishing point effect or "perspective." If that's their model, then it's not possible for the vanishing point to create the effect of the sun rising with the tip of the sun first and then the bottom of the sun last or the sunset in the reverse order hidden behind the horizon. Only a curved earth can create that effect. The vanishing point effect would not cut off portions of an object and have it gradually appear as a whole as it get's closer to you. So, the sun setting or rising over the horizon is proof the earth is a globe. With a vanishing point perspective, things only get smaller as they get further away. However, we don't see the sun getting smaller we see the sun staying the same size or even getting larger when it goes over the curvature of the earth. Therefore, the flat earth vanishing point excuse is debunked. In addition, according to flat earth models the sun and moon are rotating 620 to 3000 miles above the earth, so a vanishing point perspective would not show the sun disappearing close to the earth's surface. 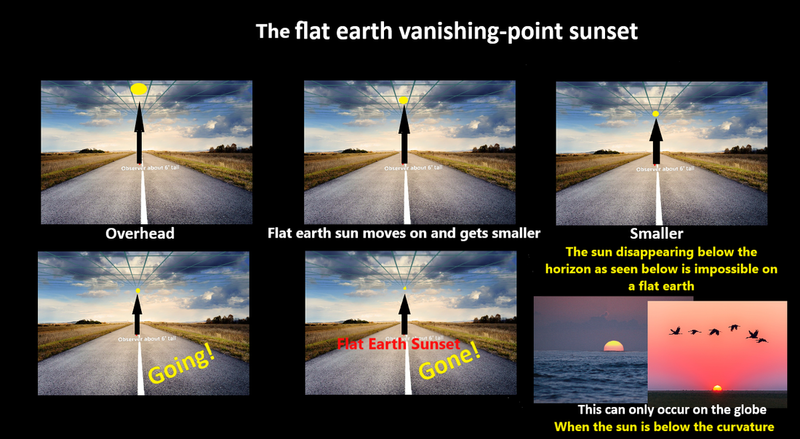 The flat earth vanishing point sunset does not fit the biblical description of the sun rising and setting. What appears to be the sun rising and setting only occurs on the globe earth because of the earth's curvature. --- Flath-earthers debunked! Does the Bible say the sun circles the earth? No! "And let them be for lights in the firmament of the heaven to give light upon the earth: and it was so." Genesis 1:15 -- The Sun is light for the earth. The sun exports light and heat to the earth from deep space. #1. The word "mowsaow" is from "motsa" Strong's H4161 and "Yatsa" Strong's H3318 which means bringing forth, to be the source, to issue, to export. Some flat-earthers even claim the flat earth sun is in the clouds which is totally unscriptural according to Psalm 19:6. The flat earth concept of a closed dome does not fit the extreme frontier narrative of Strong's H7097 seen in Psalm 19. # 3. What about the sun having a "circuit" doesn't that imply the sun moves? No! The year has a circuit also (Exodus 34:22) but does the year itself rotate? No! Then how can the year have a circuit if time does not physically rotate on its own? Simple! The earth divides the day from the night, and the spin of the earth creates a 24-hour cycle of time, which adds up to days, weeks, and months. The earth does the rotation and creates a measurable 24-hour period. Time in and of itself does not move, but the movement of the earth creates each day that moves time further along its annual circuit. Each day adds up in the cycle (circuit) of the year. So, if the circuit of a year is dependent on the earth's spin, then why can't the circuit of the sun be dependant on the earth's movement also? From earth's perspective we see the sun passing us by in a circuit but actually, the earth is the one moving and completing the circuit. It's like sitting in a car and looking out the side window watching the land zoom by. The landscape outside the car appears to be zooming by you, but it's actually the vehicle you're sitting in that's really zooming by the landscape. Circuit is from Strong's H8622 "Tequphah" and it means to turn, come around, curve, or surround. So, with all this in mind, how could Psalm 19:6 be translated? The sun brings forth (light and heat) that goes out in a 360-degree pattern encompassing the solar system. Psalm 19:6 is talking more about the suns actions in space than its effect on earth. The sun sends out light and heat from one end of the solar system to the other end. It fills the solar system with light and heat. Also, the sun appears from earth's vantage point to be moving but it's actually the earth's daily spin that creates the appearance of the sun making a circuit around the earth. If you understand these two things, then you will understand what the Bible is talking about when it mentions the circuit of the sun. So, what does this mean in regards to the flat earth? It means the flat earth model does not line up with the Bible because the verse says the sun is in extreme space, meaning extreme from planet earth's vantage point. It says the sun brings forth from its extreme region to the ends, which is correct in our solar system. The light and heat of the sun go out from one end of the solar system to the other just as the Bible teaches. ​How Long is One Day on the Other Planets? We only have one sun in our solar system, so how is it possible for the different planets to have different lengths for one day? The sun can't spin around the earth and produce 24 hours for the earth and then spin around Jupiter and create a 10 hour day for Jupiter, etc. The span of one day is dependant on the spin of the planet itself and not the sun's rotation around them. 2 Kings 20:8-11 - And Hezekiah said unto Isaiah, What shall be the sign that the LORD will heal me, and that I shall go up into the house of the LORD the third day? And Isaiah said, This sign shalt thou have of the LORD, that the LORD will do the thing that he hath spoken: shall the shadow go forward ten degrees, or go back ten degrees? And Hezekiah answered, It is a light thing for the shadow to go down ten degrees: nay, but let the shadow return backward ten degrees. And Isaiah the prophet cried unto the LORD: and he brought the shadow ten degrees backward, by which it had gone down in the dial of Ahaz. DEBUNKED: It wasn't the sun that moved it was a shadow that moved. God could have used anything to cast a shadow. However, if anyone wants to say the sun moved then they should consider the sun is a light giver, ​"Thine is the day, also Thine is the night, Thou hast prepared a light giver -- the sun." Psalm 74:16 Young's Literal Translation (YLT). Therefore, it would be the light of the sun that God would have manipulated and not the entire sun. God cannot break his covenant with day and night (with the sun). "But this is what the LORD says: I would no more reject my people than I would change my laws that govern night and day, earth and sky." Jeremiah 33:25 NLT Therefore, God would not manipulate the sun. He has others means to accomplish the same effect. Joshua 10:12-14 - Then spake Joshua to the LORD in the day when the LORD delivered up the Amorites before the children of Israel, and he said in the sight of Israel, Sun, stand thou still upon Gibeon; and thou, Moon, in the valley of Ajalon. And the sun stood still, and the moon stayed, until the people had avenged themselves upon their enemies. Is not this written in the book of Jasher? So the sun stood still in the midst of heaven, and hasted not to go down about a whole day. And there was no day like that before it or after it, that the LORD hearkened unto the voice of a man: for the LORD fought for Israel. DEBUNKED: See the debunk explanation above which applies to both claims. Also see our book titled: "Does the Bible Really Say The Sun Stopped For Joshua?" Click Here to view it. Job 22:14 - Thick clouds are a covering to him, that he seeth not; and he walketh in the circuit of heaven. ​Psalm 19:6 - His going forth is from the end of the heaven, and his circuit unto the ends of it: and there is nothing hid from the heat thereof. DEBUNKED: See the debunk section for the sun rising and setting which also talks about the circuit of the sun. Deuteronomy 4:19 - And lest thou lift up thine eyes unto heaven, and when thou seest the sun, and the moon, and the stars, even all the host of heaven, shouldest be driven to worship them, and serve them, which the LORD thy God hath divided unto all nations under the whole heaven. -- This is a warning for Israel not to follow the way of the pagan cultures that worship the sun, moon, and stars. Judges 5:20 - They fought from heaven; the stars in their courses fought against Sisera. -- This verse is part of a song so it must be understood in the context of being poetic lyrics. This verse shows the battle was fought at night and either the night sky was very bright offering Israel the advantage to see the enemy or the night sky was dark from cloud cover and the light of the night sky was hidden behind the clouds. The very next verse (verse 21) says: "The river of Kishon swept them away, that ancient river, the river Kishon" Therefore, it's likely the stars could not be seen because they were hidden by cloud cover making the night extremely dark and when the army of Sisera attempted to cross the river they got swept away. The song goes on to reveal Sisera was killed by a woman that drove a tent peg through his skull. So, the stars did not literally fight against Sisera. Job 9:7 - Which commandeth the sun, and it riseth not; and sealeth up the stars. -- This just means the sun and stars are covered by either clouds or smoke. If God seals up the stars then that means something is over them. Job 38:7 - When the morning stars sang together, and all the sons of God shouted for joy? -- Figurative. Psalm 147:4 - He telleth the number of the stars; he calleth them all by their names. -- This is the same God that counts each hair on our head (Matthew 10:30) so should it be a surprise that he also named each star he created? Even humans give names to the stars and constellations. This is not proof the stars are angels. Psalm 148:3 - Praise ye him, sun and moon: praise him, all ye stars of light. -- See the debunked section below. Daniel 8:10 - And it waxed great, even to the host of heaven; and it cast down some of the host and of the stars to the ground, and stamped upon them. -- There is debate among scholars if the stars in this verse represent angels or Israel and its leaders. This is a dual prophecy of Antiochus and later the Antichrist. If it speaks of fallen angels then why would the Antichrist stomp on them? Aren't fallen angels allies with the Devil and Antichrist? The angels of heaven far outnumber the fallen angels so I doubt the beast (a man) would be able to overcome the angelic spirits of God. Therefore, it's more likely this verse is referring to Israel as in the people and leaders of Israel. Other biblical passages use stars to represent Israel (Genesis 22:17, 37:9-11; Revelation 12:1). Since this is a dual prophecy for Antiochus and the Antichrist, then we would have to read about Antiochus stumping angels or literal stars (as some flat-earthers believe) on the ground. However, nothing like this is ever recorded, but we do hear of Antiochus persecuting and killing the people of Israel. Therefore, the stars again represent Israel. Either way, Daniel 8:10 is figurative language and not literal. The literal stars are not people or angels. Joel 3:15 - The sun and the moon shall be darkened, and the stars shall withdraw their shining.​ -- This only shows the sun, moon, and stars will be covered by either clouds or thick smoke. Amos 5:26 - But ye have borne the tabernacle of your Moloch and Chiun your images, the star of your god, which ye made to yourselves. -- This star was likely the planet Saturn. Yes, ancient astronomers knew the difference between stars and wandering stars (planets). This is not talking about the literal stars or planets being angelic beings. If you believe that then you're no different from the idol worshippers described in this verse. Matthew 24:29 - Immediately after the tribulation of those days shall the sun be darkened, and the moon shall not give her light, and the stars shall fall from heaven, and the powers of the heavens shall be shaken. -- This verse is a sign of the end times when the sun and moon will be dark, and stars will fall from heaven like we see a great star falling from heaven hitting earth in Revelation 8:10-11. There will be a lot of cosmic occurrence during the last days. This verse does not say the literal stars are angels. Acts 7:43 - Yea, ye took up the tabernacle of Moloch, and the star of your god Remphan, figures which ye made to worship them: and I will carry you away beyond Babylon. --- The same as Amos 5:26 listed above. Jude 1:13 - Raging waves of the sea, foaming out their own shame; wandering stars, to whom is reserved the blackness of darkness for ever. -- The wandering stars are planets, and this verse is a metaphor for false teachers that crept into the church. Jude is making a list of comparisons about false teachers. These men are being compared to the wandering stars (planets) in space. Wandering stars are different from other lights in the sky because planets are moving in space like the earth moves in space, unlike the majority of the stars that appear to be fixed in the night sky. This verse has nothing to do with literal stars or planets being men or angels in the sky. Revelation 1:20 - The mystery of the seven stars which thou sawest in my right hand, and the seven golden candlesticks. The seven stars are the angels of the seven churches: and the seven candlesticks which thou sawest are the seven churches. -- These are seven church leaders or messengers. Revelation 6:13 - And the stars of heaven fell unto the earth, even as a fig tree casteth her untimely figs, when she is shaken of a mighty wind. -- This is part of a cosmic event and not angels falling out of heaven. Revelation 8:10-11 - And the third angel sounded, and there fell a great star from heaven, burning as it were a lamp, and it fell upon the third part of the rivers, and upon the fountains of waters; And the name of the star is called Wormwood: and the third part of the waters became wormwood; and many men died of the waters, because they were made bitter. -- Probably a meteor. Revelation 9:1 - And the fifth angel sounded, and I saw a star fall from heaven unto the earth: and to him was given the key of the bottomless pit. -- See the debunk section below. Revelation 12:4 - And his tail drew the third part of the stars of heaven, and did cast them to the earth: and the dragon stood before the woman which was ready to be delivered, for to devour her child as soon as it was born. -- See the debunk section below. In Psalm 148:3 we can clearly see the Bible using a figurative approach about the heavens speaking, but then the Bible clarifies the heavens don't have literal voices. In a figurative way, the heavens speak to us by showing God's glory. However, Psalm 19 gives us the key to understanding Psalm 148:3 and other poetic passages. Psalm 148:3 is not talking about the stars literally speaking and praising. The verse is meant to be taken figuratively so that someone with common sense would not only get the words but also get the feeling behind the message like a song delivers words and stirs emotion. In addition, in Psalm 148:3 the stars can't represent the angels because the verse before it (verse 2) says, "Praise ye him, all his angels: praise ye him, all his hosts." Therefore, the stars are different from the angels. ​Job 38:7; Revelation 9:1, and 12:4 could represent angelic beings but the keyword is "represent." Flat-earthers that claim the stars and planets are literally heavenly beings, put themselves on par with pagan cultures. The Bible does not teach the stars are angels in a literal sense but may use the stars to represent angels (good and bad) in a figurative way. If the angels were literally the stars in space, then the Bible would be a confusing set of books because it also speaks of men as being stars. This whole claim and belief that the stars in the sky are really angels just shows the wicked origins of flat earth doctrine which attempts to bring ancient pagan beliefs into the church. Genesis 7:11 -In the six hundredth year of Noah's life, in the second month, the seventeenth day of the month, the same day were all the fountains of the great deep broken up, and the windows of heaven were opened. 2 Kings 7:2 -Then a lord on whose hand the king leaned answered the man of God, and said, Behold, if the LORD would make windows in heaven, might this thing be? And he said, Behold, thou shalt see it with thine eyes, but shalt not eat thereof. 2 Kings 7:19 - And that lord answered the man of God, and said, Now, behold, if the LORD should make windows in heaven, might such a thing be? And he said, Behold, thou shalt see it with thine eyes, but shalt not eat thereof. Isaiah 24:18 - And it shall come to pass, that he who fleeth from the noise of the fear shall fall into the pit; and he that cometh up out of the midst of the pit shall be taken in the snare: for the windows from on high are open, and the foundations of the earth do shake. Malachi 3:10 - Bring ye all the tithes into the storehouse, that there may be meat in mine house, and prove me now herewith, saith the LORD of hosts, if I will not open you the windows of heaven, and pour you out a blessing, that there shall not be roomenough to receive it. DEBUNKED: ​If flat-earthers believe the windows and doors of heaven are literal windows and doors in their solid flat earth dome, then where do they place the water jars in the sky (Job 38:37)? Flat-earthers take the poetic text in the Bible and interpret it as literal. So, if flat-earthers believe there are literal windows and literal doors in the sky, then their method of biblical interpretation requires them to also believe there are literal water jars in the sky that pour out water on the earth. From what we have seen already throughout this refute of the 300+ flat earth scriptures, flat-earthers have a flawed understanding of the Bible. Psalm 78:23 is an excellent example to show flat-earther error. Flat-earthers claim this verse means there are literal windows and doors on their dome/firmament. Just read the text for yourself. "And He commandeth clouds from above, Yea, doors of the heavens He hath opened." Psalm 78:23 Young's Literal Translation. What are the doors of the heavens? They're clouds. God commanded the clouds, and figuratively it's like God opening up doors/gates in the sky when they release rain. How do we know this verse is talking about the clouds? Because the verse uses the Hebrew word for vapor, powder, and clouds from "shachaq" Strong's H7834. Therefore, windows of heaven and doors of heaven are figurative speech/text representing God pouring out something (reward or judgment) on the earth. The windows and doors of heaven, are not literal doors and windows in heaven, these are simple phrases to represent an open heaven or the clouds pouring out rain, hail, etc. Isaiah 60:19 - The sun shall be no more thy light by day; neither for brightness shall the moon give light unto thee: but the LORD shall be unto thee an everlasting light, and thy God thy glory. Isaiah 60:20 - Thy sun shall no more go down; neither shall thy moon withdraw itself: for the LORD shall be thine everlasting light, and the days of thy mourning shall be ended. -- How does this verse prove the flat earth model? Ezekiel 32:7 - And when I shall put thee out, I will cover the heaven, and make the stars thereof dark; I will cover the sun with a cloud, and the moon shall not give her light. ​Revelation 21:23 - And the city had no need of the sun, neither of the moon, to shine in it: for the glory of God did lighten it, and the Lamb is the light thereof. DEBUNKED: It's important to note that people from earth do see shadows on the moon through inexpensive telescopes. Amateur astronomers have and continue to take pictures of the moon with shadows on its surface and inside lunar craters, which proves the light on the moon is from an external source. If the moon generated its own light, then there wouldn't be shadows on the lunar surface. This proof (shadows on the moon) is something we can easily observe from earth, so flat-earthers can't blame NASA in an attempt to debunk this evidence. 1. It debunks the lie that the sun is a giant spotlight only aimed at the earth. Without the light from the sun, we cannot have phases of the moon. This means the flat earth sun must shine on the moon and can't be a giant spotlight only shining down on the earth, as flat-earthers claim. This also means the flat sun could be seen from a great distance on the flat earth and it would illuminate a huge portion, if not all, of the flat earth dome. Something we don't see on our planet. Reality once again debunks flat-earther logic and wild imaginations. Click here to watch an excellent video that shows how the phases of the moon work. 2. Shadows on the moon prove the moon cannot be self-illuminated. Like the sun or a light bulb, the entire surface of the moon would be illuminated without shadows if the moon produced its own light. Therefore, the whole claim that the moon is self-illuminated again debunked by reality. ​​Doesn't the Bible Say The Moon Creates Its Own Light? ​No! Just because the Bible says the moon gives light, does not prove the moon creates its own light. When Moses spoke to God, he reflected the glory of God on his face. This light was so bright that Moses had to wear a veil over his face (Exodus 34:28-35). Moses did not generate or create this light because Moses only received this light when he talked with God (Exodus 34:29). When the 12 apostles were sent out to "freely give" what were they giving? Were they giving something they created or generated within themselves? No. They were giving what they received from Yeshua (Jesus) - See Matthew 10:8. Therefore, just because the Bible says the moon gives light does not mean the moon creates the light. Like Moses and the 12 apostles who reflected or gave what they received, the moon also gives out (reflects) the light it receives from the sun. The Bible says, when the sun grows seven times brighter the moon is also made brighter (Isaiah 30:26) which shows the connection between the light of the sun and the light the moon. The moon is a reflection of the sun's light. In Genesis 1:16, we see that God created the sun to be a greater light than the moon. This means the light of the moon is inferior to the light of the sun. In our solar system, the light (Strong's H216) is a product of the sun, which is why the sun is the "greater" light and the moon only reflects the light of the sun. Technically, the sun illuminates the moon and the light of the illuminated moon is scattered in many directions. The sun is a ball of fire and the moon is just a rock. The Bible affirms the sun is made of fire. The Bible affirms the moon is associated with being like a white brick. The Hebrew word "lebanah" (Strong's H3842), is another name for the moon and lebanah is derived from "laban" (Strong's H3835), which means a "white brick." So, in the ancient Hebrew thinking, they envisioned the moon as an illuminated rock or as a white brick, which means its very unlikely the ancient Hebrew people believed the moon created its own light like the fiery sun does. ​The ancient Hebrews knew the difference between the sun and moon and they knew the sun was made of fire and was the source of light which illuminated the moon. Clearly, the ancient Hebrews were much smarter than modern day flat-earthers. Isaiah 66:1 - Thus saith the LORD, The heaven is my throne, and the earth is my footstool: where is the house that ye build unto me? and where is the place of my rest? Matthew 5:35 - Nor by the earth; for it is his footstool: neither by Jerusalem; for it is the city of the great King. Acts 7:49 - ​Heaven is my throne, and earth is my footstool: what house will ye build me? saith the Lord: or what is the place of my rest? DEBUNKED: The idea that the earth is God's footstool is just a metaphor for showing he dwells on earth and the earth is under his authority. David wanted to build a temple for the Ark of the Lord, the footstool of God. The footstool is a figurative refrence to the Ark, the resting place of God. ​But God made it known that he is greater than the Temple and the earth. To use this figurative language as proof the earth is flat like a footstool is silly. These passages of scripture are not communicating a message about the size and shape of the earth -- That's not the point! The point of the message is that God is greater than the Temple and humanity cannot confine God to a building on the earth or even the earth itself. The earth is under God's feet, which is a symbol of his authority over the planet he created and the inhabitants that dwell therein. Passages that say the earth or the Ark is God's footstool are just using a metaphor to show a greater truth about his omniscience, ominiprecense, and lordship over his creation. Flat-earthers should consider one thing before they take figurative footstool passages and turn them into a literal description of the earth. If they're going to take these footstool passages literal, then the flat earth will fail to fit the description of a flat footstool. They forget they claim to have a semi-spherical dome over their square, flat earth. Therefore, if God was literally resting his feet on the earth, he would have to do so on top of the flat earth dome. So, whats the difference if he does that on the semi-spherical flat earth dome or the spherical earth? There is none! Job 1:7 - And the LORD said unto Satan, Whence comest thou? Then Satan answered the LORD, and said, From going to and fro in the earth, and from walking up and down in it. Job 38:31 - Canst thou bind the sweet influences of Pleiades, or loose the bands of Orion? Job 38:32 - Canst thou bring forth Mazzaroth in his season? or canst thou guide Arcturus with his sons? Genesis 28:12 - And he dreamed, and behold a ladder set up on the earth, and the top of it reached to heaven: and behold the angels of God ascending and descending on it. -- This is a dream, so it should be interpreted in that context. Numbers 16:31-33 -And it came to pass, as he had made an end of speaking all these words, that the ground clave asunder that wasunder them: And the earth opened her mouth, and swallowed them up, and their houses, and all the men that appertained unto Korah, and all their goods. They, and all that appertained to them, went down alive into the pit, and the earth closed upon them: and they perished from among the congregation. 1 Samuel 28:13-14 - And the king said unto her, Be not afraid: for what sawest thou? And the woman said unto Saul, I saw gods ascending out of the earth. And he said unto her, What form is he of? And she said, An old man cometh up; and he is covered with a mantle. And Saul perceived that it was Samuel, and he stooped with his face to the ground, and bowed himself. 1 Chronicles 29:11 - Thine, O LORD, is the greatness, and the power, and the glory, and the victory, and the majesty: for all that is in the heaven and in the earth is thine; thine is the kingdom, O LORD, and thou art exalted as head above all. 2 Chronicles 6:4 -7 - And he said, Blessed be the LORD God of Israel, who hath with his hands fulfilled that which he spake with his mouth to my father David, saying, Since the day that I brought forth my people out of the land of Egypt I chose no city among all the tribes of Israel to build an house in, that my name might be there; neither chose I any man to be a ruler over my people Israel: But I have chosen Jerusalem, that my name might be there; and have chosen David to be over my people Israel. Now it was in the heart of David my father to build an house for the name of the LORD God of Israel. Psalm 113:5-6 - Who is like unto the LORD our God, who dwelleth on high, Who humbleth himself to behold the things that are in heaven, and in the earth! Psalm 119:19 -I am a stranger in the earth: hide not thy commandments from me. Isaiah 14:9-11 - Hell from beneath is moved for thee to meet thee at thy coming: it stirreth up the dead for thee, even all the chief ones of the earth; it hath raised up from their thrones all the kings of the nations. All they shall speak and say unto thee, Art thou also become weak as we? art thou become like unto us?Thy pomp is brought down to the grave, and the noise of thy viols: the worm is spread under thee, and the worms cover thee. Isaiah 51:13-14 - And forgettest the LORD thy maker, that hath stretched forth the heavens, and laid the foundations of the earth; and hast feared continually every day because of the fury of the oppressor, as if he were ready to destroy? and where is the fury of the oppressor? The captive exile hasteneth that he may be loosed, and that he should not die in the pit, nor that his bread should fail. Debunked: This claim and the associated scriptures do not prove the earth is flat. Nor does it prove the mythical dome exists. The idea that there is a heaven above, the earth, and an underworld is a belief that globe-earthers believe as well, so it's not a belief exclusive to flat-earthers. Therefore, this claim and the associated scriptures prove nothing in regards to the flat earth. DEBUNKED: Having a globe on a desk or making maps of the earth is not idolatry. No one is worshiping and bowing down before their globes to worship them. Flat-earthers forget to include the rest of the commandment. Flat-earthers also forget the Ark was made with images of cherubim (Exodus 25:18) and Moses created a brass snake (Numbers 21:8-9). The carved image of palm trees, the face of a man, and the face of a lion were in the Temple of Ezekiel (Ezekiel 41:18-26 also see Solomon's Temple in 1 Kings 6:29). These things were not idols because they were not made to be worshipped. In fact, Israel kept the brass snake around long after they entered the promised land, but it was broken into pieces when it was discovered that people turned it into an idol and were burning incense to the brass snake (2 Kings 18:4). Instead of making ridiculous statements like this, flat-earthers should consider how they made their own flat earth myth an idol in their life and have elevated this myth above the Gospel message and above the teachings of Yeshua (Jesus). Colossians 2:8 - Beware lest any man spoil you through philosophy and vain deceit, after the tradition of men, after the rudiments of the world, and not after Christ. 1 Corinthians 3:19 - ​For the wisdom of this world is foolishness with God. For it is written, He taketh the wise in their own craftiness. DEBUNKED: The understanding that the earth is a globe has been around for thousands of years. This flat earth myth as we know it today is only a recent phenomenon in the historical timeline. This modern myth only originated in the mid-1800s. The flat earth, is truly an end time delusion designed to bring discredit to God's word and flat-earthers have fallen for this delusion. They are the ones bringing false teachings, vain deceit, babblings, and opposing proven science. Flat-earthers are the ones promoting false wisdom as we can clearly see by their false claims about the Bible in this list of 300+ flat earth scriptures. Our debunk of their "wisdom" using the Bible proves flat earth wisdom is a false wisdom. DEBUNKED: This is not a literal tree and this text goes beyond just being figurative language. Daniel 4, is talking about a dream that King Nebuchadnezzar had and Daniel interpreted. So, the images and events from the dream are not real, their symbolic. Flat-earthers believe this tree is real, but Daniel 4:22 tells us the tree represents King Nebuchadnezzar. "It is thou, O king, that art grown and become strong: for thy greatness is grown, and reacheth unto heaven, and thy dominion to the end of the earth." Did flat-earthers take the time to actually read this chapter before they claimed it as proof for their flat earth? 1. This is a dream filled with symbology. 2. The tree is not a real tree. 3. Daniel interpreted the dream for the king and said Nebuchadnezzar is the tree. This is more evidence flat-earthers don't comprehend or interpret the Bible properly. Luke 4:5 - And the devil, taking him up into an high mountain, shewed unto him all the kingdoms of the world in a moment of time. DEBUNKED: Luke reveals what's really happening with this event. The devil showed Yeshua (Jesus) all the kingdoms of the world "in a moment of time " Therefore, the fact that the devil can show Yeshua (Jesus) all the kingdoms of the earth (most likely present and future) and all their glory in a "moment of time" proves this was very likely a vision. The fact that the devil took Yeshua on a mountain proves nothing because there is no mountain high enough in Israel, the middle east or the world for that matter that would give one a vantage point to see the entire earth. The point is not the mountain it's the seconds, the speed at which Yeshua was able to see all the kingdoms of the earth. Only a vision can do that, not elevation. However, if flat-earthers want to claim the devil proved the earth is flat, then we really can see the origins of the flat earth movement. Revelation 1:7 - ​Behold, he cometh with clouds; and every eye shall see him, and they also which pierced him: and all kindreds of the earth shall wail because of him. Even so, Amen. DEBUNKED: Just because "every eye" will see Yeshua (Jesus) at his second coming does not prove the earth is flat. It proves God is awesome and can do anything. Is it too hard for God to give every person on the earth a simultaneous vision of Yeshua's (Jesus) coming? If flat-earthers believe God is incapable of giving everyone on earth a personal vision or personal message then how do they explain the announcements of the angels? How can every individual on the earth hear the messages of one angel in their own language? There are thousands of languages around the world. But God will make it possible so that all languages can understand the angels. And, I believe he will do the same so every person on the earth can see the arrival of Christ. You don't need a flat earth to make this possible, you just need the power of God. Yet, it appears flat-earthers have little faith in God's ability. Revelation 21:15-17 - And he that talked with me had a golden reed to measure the city, and the gates thereof, and the wall thereof. And the city lieth foursquare, and the length is as large as the breadth: and he measured the city with the reed, twelve thousand furlongs. The length and the breadth and the height of it are equal. And he measured the wall thereof, an hundred and forty and four cubits, according to the measure of a man, that is, of the angel. DEBUNKED: Some believe the New Jerusalem is a cube and others believe it's a pyramid or mountain. Either way, New Jerusalem is huge. Flat-earthers claim New Jerusalem can never fit on a globe because of the curvature of the earth. They claim the New Jerusalem would not have a level foundation to rest on and it would wobble on the earth. This claim limits the wisdom and power of God and suggests he is incapable of adjusting the foundations of New Jerusalem to compensate for curvature. What flat-earthers never look at are the problems the New Jerusalem will bring to the flat earth model. Revelation 21:23 - "And the city had no need of the sun, neither of the moon, to shine in it: for the glory of God did lighten it, and the Lamb is the light thereof." -- The sun and moon are still around but it's only the people in the New Jerusalem that don't need their light. God is their light. Revelation 22:5 - "And there shall be no night there; and they need no candle, neither light of the sun; for the Lord God giveth them light: and they shall reign for ever and ever." -- No need for candles or the light of the sun because God is the light in the New Jerusalem. Isaiah 60:1-3,19-20 - "Arise, shine; for thy light is come, and the glory of the LORD is risen upon thee. For, behold, the darkness shall cover the earth, and gross darkness the people: but the LORD shall arise upon thee, and his glory shall be seen upon thee. And the Gentiles shall come to thy light, and kings to the brightness of thy rising. The sun shall be no more thy light by day; neither for brightness shall the moon give light unto thee: but the LORD shall be unto thee an everlasting light, and thy God thy glory. Thy sun shall no more go down; neither shall thy moon withdraw itself: for the LORD shall be thine everlasting light, and the days of thy mourning shall be ended." -- If the Gentiles come to the light then that means they're in darkness. Why would you go to a light source if the light was already at your location? The text also shows the sun and moon still exist, but for those in New Jerusalem, they don't need the sun and moon. These verses show the glory of God will outshine the sun and moon so their light will be ineffective in the New Jerusalem. However, for the rest of the earth, the sun and moon are still needed. In addition, the Bible makes it clear that the sun, moon, and stars will be around forever. Psalm 148:3-6 - "Praise ye him, sun and moon: praise him, all ye stars of light. Praise him, ye heavens of heavens, and ye waters that be above the heavens. Let them praise the name of the LORD: for he commanded, and they were created. He hath also stablished them for ever and ever: he hath made a decree which shall not pass." Psalm 89:35-37 - "Once have I sworn by my holiness that I will not lie unto David. His seed shall endure for ever, and his throne as the sun before me. It shall be established for ever as the moon, and as a faithful witness in heaven. Selah." The flat earth is not a good fit for the New Jerusalem -- Let's look at their model. The flat earth dome that holds all the stars will still be around when the New Jerusalem lands on earth and the flat earth sun and moon under the dome will continue to rotate over the earth when the New Jerusalem arrives. So, the questions are, how does the New Jerusalem go from the outside of the flat earth dome into the inside of the dome so it can land on earth? New Jerusalem is a physical city, with solid walls, solid foundations, and solid gates. So, how does it get through the solid flat earth dome without crashing into it and breaking it? if it crashes through the dome, it will destroy the sun, moon, and stars with it. Can God open a huge window 1500 miles wide by 1500 miles long on the dome? According to flat-earthers that would cause a massive amount of water (waters above the heavens) to come plunging down on the earth. Therefore, that won't work. The flat earth dome can't be done away with because the dome contains the stars and the stars last forever according to the Bible. Flat-earthers have a real dilemma trying to figure out how New Jerusalem will get through their solid, flat earth dome. Even if the New Jerusalem makes it inside their solid dome how would it fit? A flat-earther who won an award for the "Best dome Video" at the 2017 International Flat Earth Convention, believes the flat earth dome could be 620 miles or less. So, how do you get 1,500 miles high, by 1,500 miles wide, by a 1,500-mile long city under a 620-mile dome? You can't! Another huge issue is that more and more flat-earthers believe the sun and moon are as low as the clouds. However, clouds usually go no higher than 60,000 feet  which is a little less than 12 miles. So, how will the flat earth sun and moon continue to rotate at 12 miles high with the 1,500 miles high, foursquare megacity, in the way? You can't. It appears the New Jerusalem can't land on the flat earth model. Matthew 24:24 - ​For there shall arise false Christs, and false prophets, and shall shew great signs and wonders; insomuch that, if it were possible, they shall deceive the very elect. Mark 13:22 - For false Christs and false prophets shall rise, and shall shew signs and wonders, to seduce, if it were possible, even the elect. ​Ephesians 5:6 - Let no man deceive you with vain words: for because of these things cometh the wrath of God upon the children of disobedience. DEBUNKED: ​THIS DOES NOT PROVE THE EARTH IS FLAT! This is nothing more than flat-earther anger against believers that disagree with the flat earth myth. The Bible is not a flat-earth book clear and simple, but flat-earthers can't handle that truth so they lash out. Flat-earthers also try to validate their myth by showcasing all the converts they claim they gained because of the flat earth. They will list off all the atheists that now believe because of flat earth teachings. But, if these flat earth converts are basing their faith on flat earth teachings or the shape of the earth and not on the solid foundation of Christ, then they are sure to have problems when they wake up and discover the shape of the earth is really a globe. Having flat earth teaching as the foundation of your faith is sure to lead to spiritual failure. Flat-earthers are preaching a different Gospel. They preach a message that mocks the Bible and makes all believers look foolish. In order to believe in a flat earth, you must believe in a worldwide conspiracy and slander millions of people by calling them all liars. This is clearly a sinful act! However, you can't be a true flat-earther unless you call all the innocent employees of NASA liars, the innocent people that live and work at Antarctica liars, and call all the innocent people that believe in a globe earth a bunch of fools. The core of flat earth teaching requires you to make false accusations, spread false reports, and to slander people. So, to believe in and to preach the flat earth message you must commit sin. Watch flat earth videos and 99.9% of the time you will hear their videos filled with slander against the employees of NASA, against military personnel, and against anyone that debunks the flat earth. If any teaching requires you to commit sin, then that teaching is not from God. Therefore, flat earth teaching is not from God. ​After viewing this page, and seeing how our ministry used the Bible to debunk over 300 scriptures that flat-earthers misinterpreted and twisted to prove their flawed flat earth doctrine, we ask you to repent of your flat earth beliefs. This belief system is not of God, and it's not supported by the Bible. By believing in the flat earth error, you are doing harm to God's word by bringing mockery upon it. Don't be a false teacher and spread this lie around the world. Stop bearing false witness against innocent people and stop spreading false reports. Stop sinning! Belief in this false teaching (the flat earth) is a salvation issue. Belief in the flat earth will damage your faith, damage your understanding of the scriptures, damage your understanding of God, and will damage your testimony before others. Repent from this false teaching and renounce it. Don't let your pride get in the way of truth. It's better to admit you were wrong than to continue to live in error. We have shown you the truth according to the scriptures. Therefore, live in the real truth that the Bible genuinely affirms. The earth is not flat! The Bible affirms the earth is a curved, circular, and it spins. Prayer: Yeshua (Jesus), I repent of my flat earth beliefs and any harm I did to bring shame and mockery to the scriptures. I repent of leading people astray and repent of false accusations I have made toward others. Forgive me of these sins and anything else I have done because of this false teaching. Forgive me and help me to see the truth of your word. Help me to push aside this false teaching from my life and help me to speak against it. Thank you, for your mercy, love, forgiveness, and help. Amen! Amos 9:6. The Cambridge Bible for Schools and Colleges (Commentary). J. J. Steward, editor. Cambridge MA: Cambridge University Press, 1904. Accessed June 24, 2018. http://biblehub.com/commentaries/amos/9-6.htm and also John Gill's Exposition of the Entire Bible at the same link. Unless otherwise indicated the KIng James Version was used. NLT - Scripture quotations marked (NLT) are taken from the Holy Bible, New Living Translation, copyright ©1996, 2004, 2015 by Tyndale House Foundation. Used by permission of Tyndale House Publishers, Inc., Carol Stream, Illinois 60188. All rights reserved. YLT - Young's Literal Translation (PD).